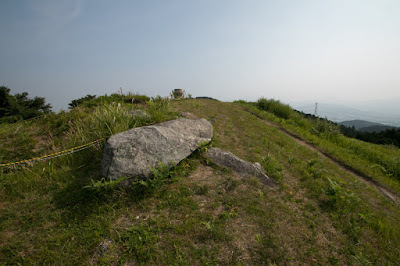 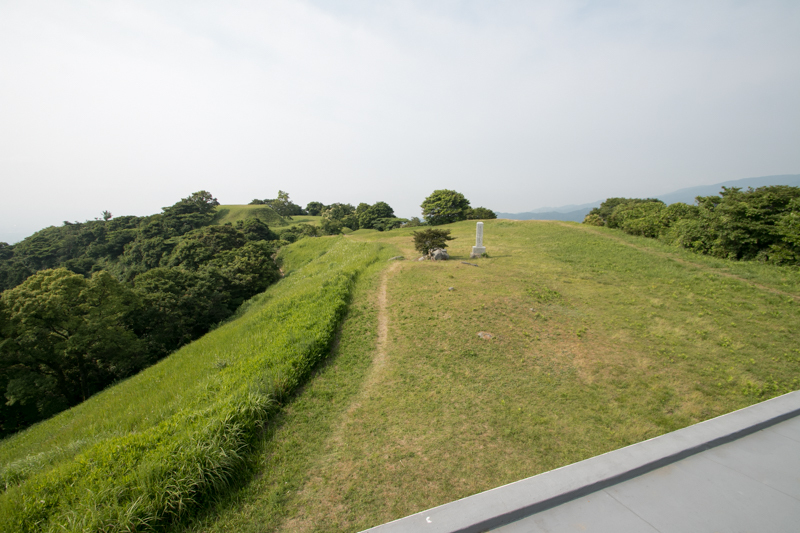 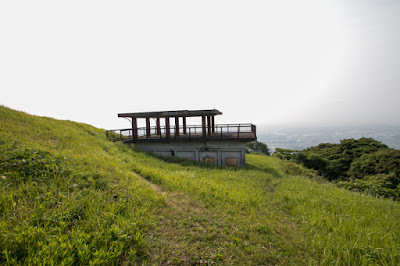 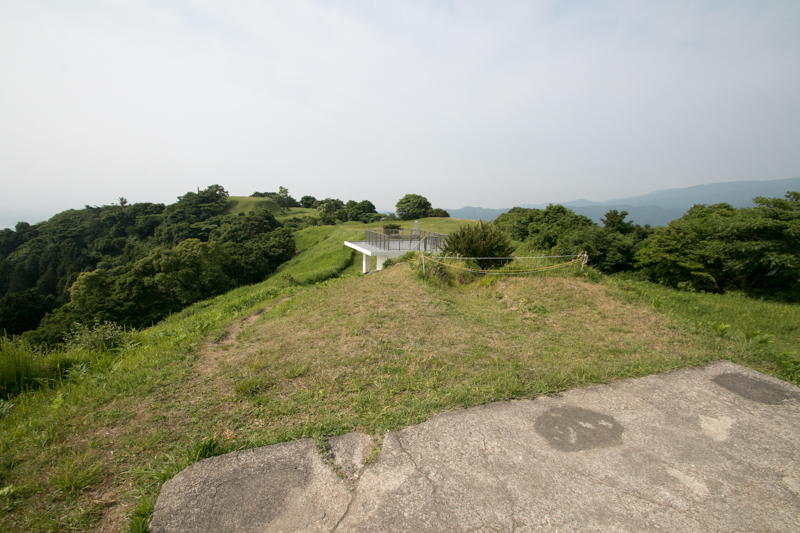 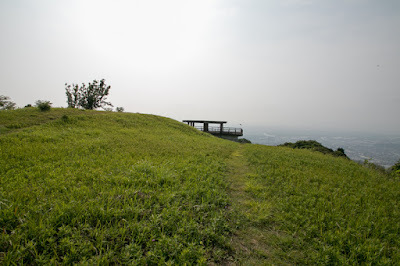 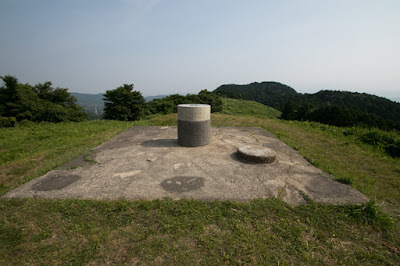 Kii castle (基肄城) spreads from the top of the halfway of Kizan mountain, one of about 250 meter height from hillside at the border of current Fukuoka prefecture and Saga prefecture. 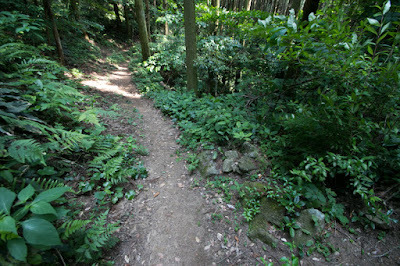 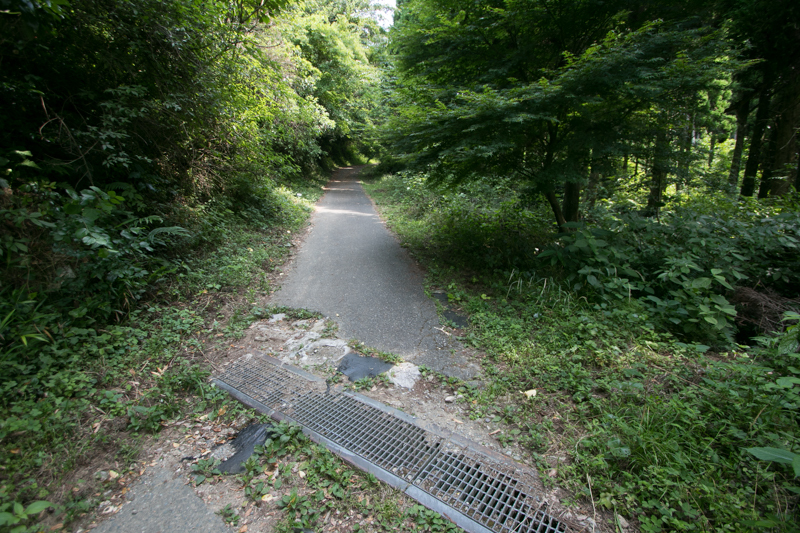 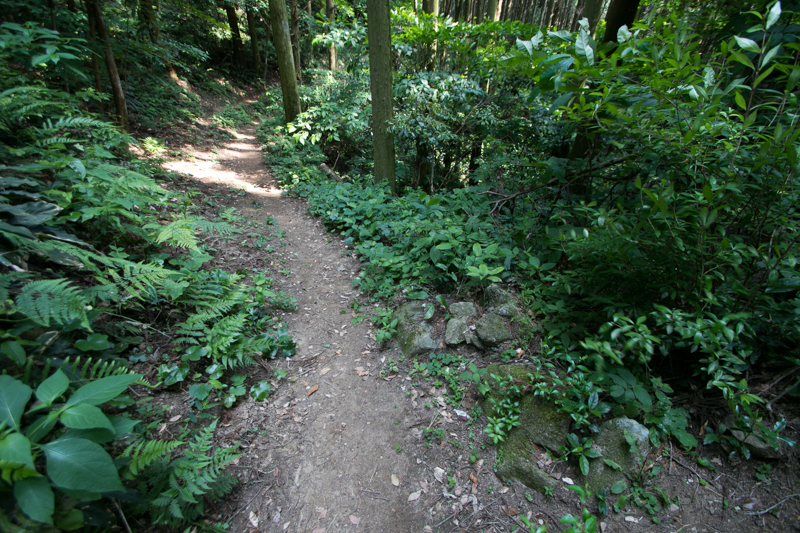 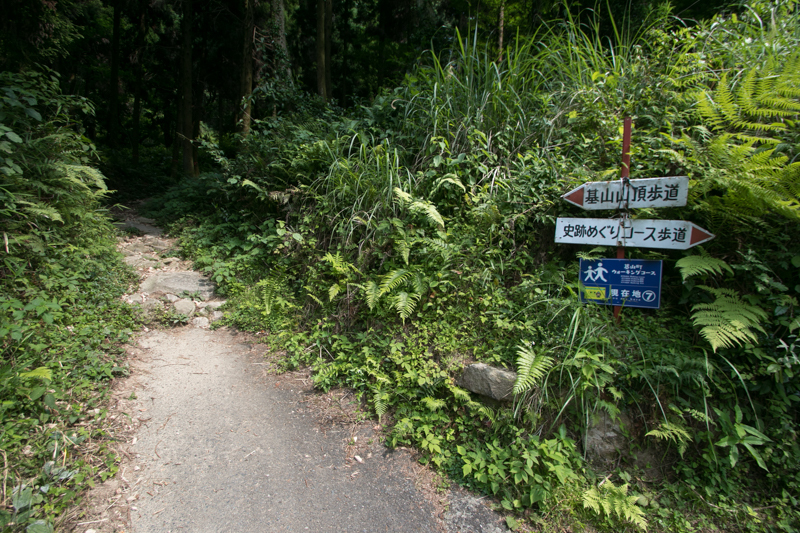 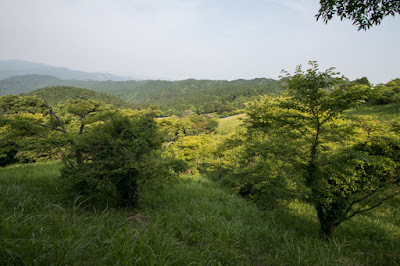 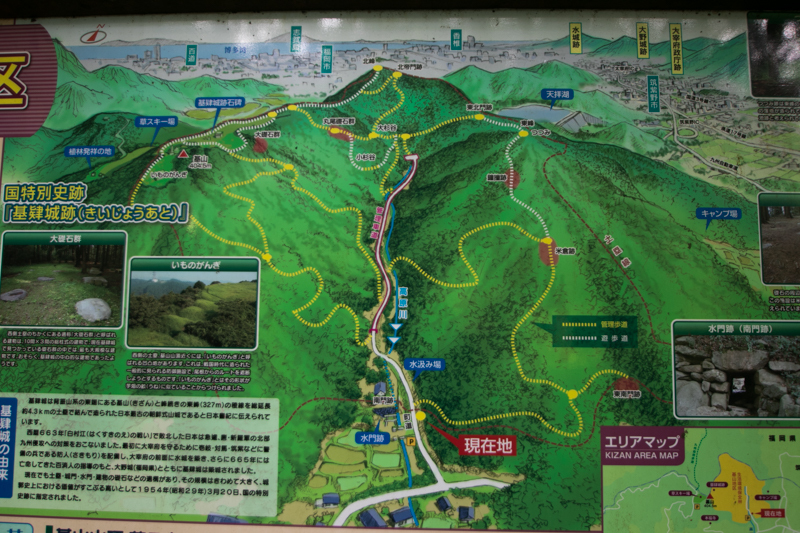 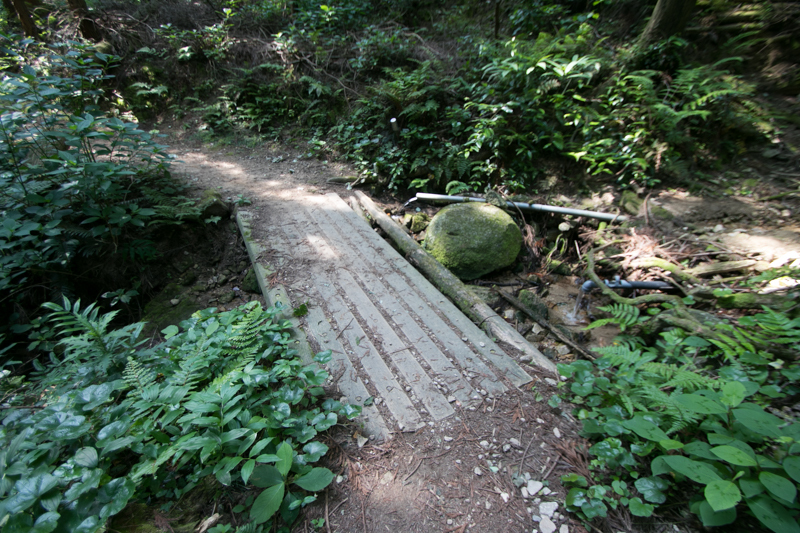 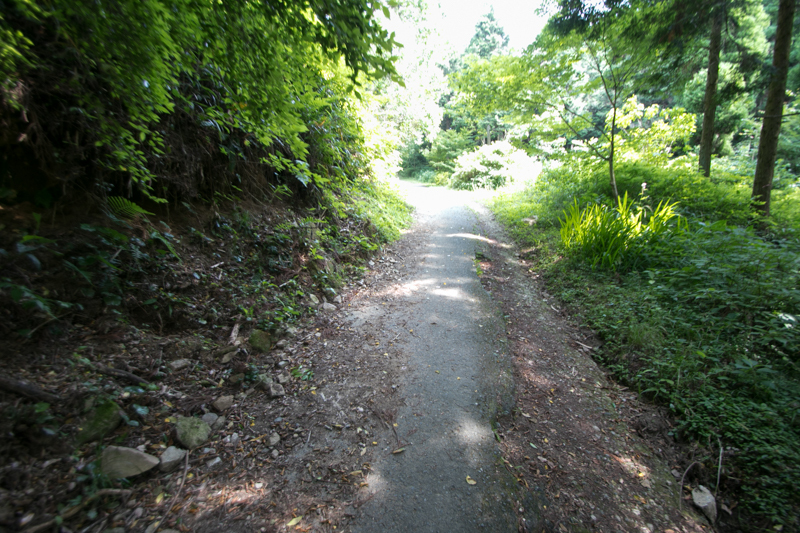 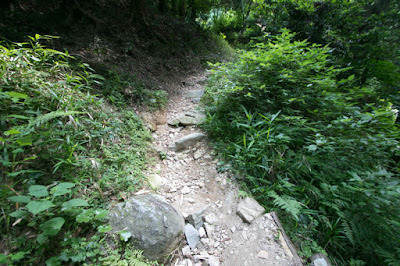 The narrow valley between Kizan mountain and Miyaji-dake mountain at the opposite is an important route of transportation, and even now main important roads and lines pass around this area, except for Kyushu Shinkansen line which underpass backside mountain by long tunnel. 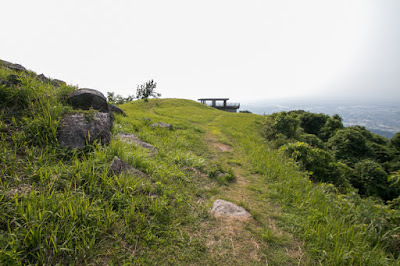 Kii castle exists at the south edge of corridor area which is about 5 kilometer long and 2 kilometer wide between Seburi mountains and Mito mountains. 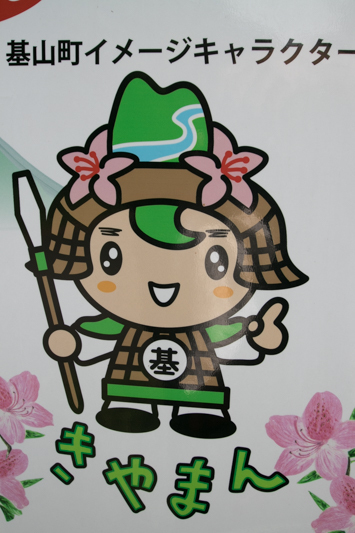 Ancient Japan which faced foreign powers virtually only at the north part of Kyushu region built Dazaifu city, the vice capital of Japan which manages the foreign negotiation and military operation between foreign powers, at this narrow corridor considering its easiness for defense. 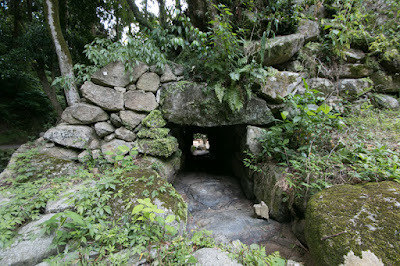 As both side of this corridor is protected by mountains, defense lines were built at the north and south edge. 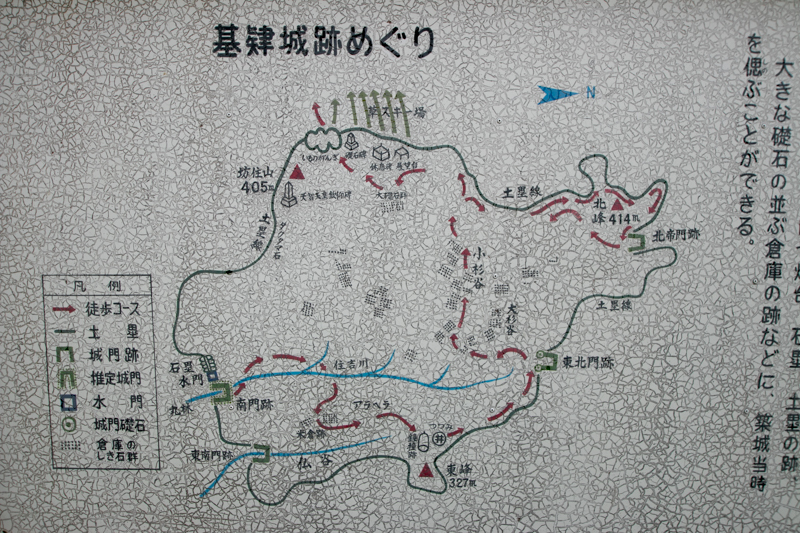 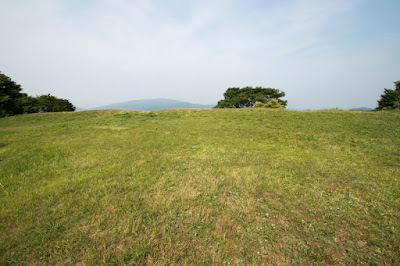 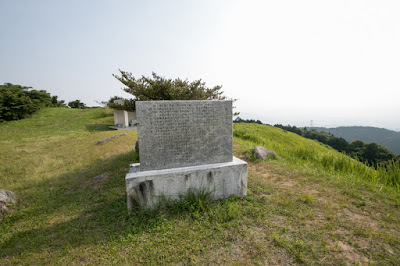 At the north edge which might be a front line against the enemy, Onojo castle (Fukuoka prefecture) which was the largest ancient castle and an evacuation place of government agencies protected the east edge of north line. 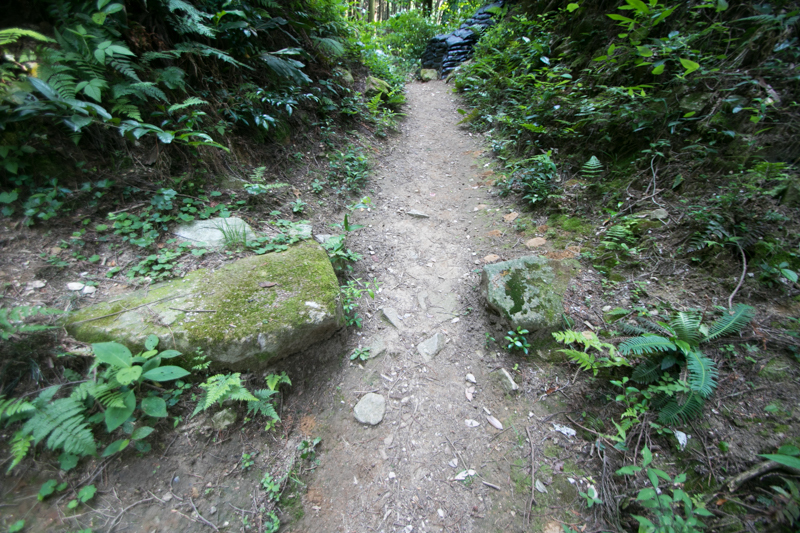 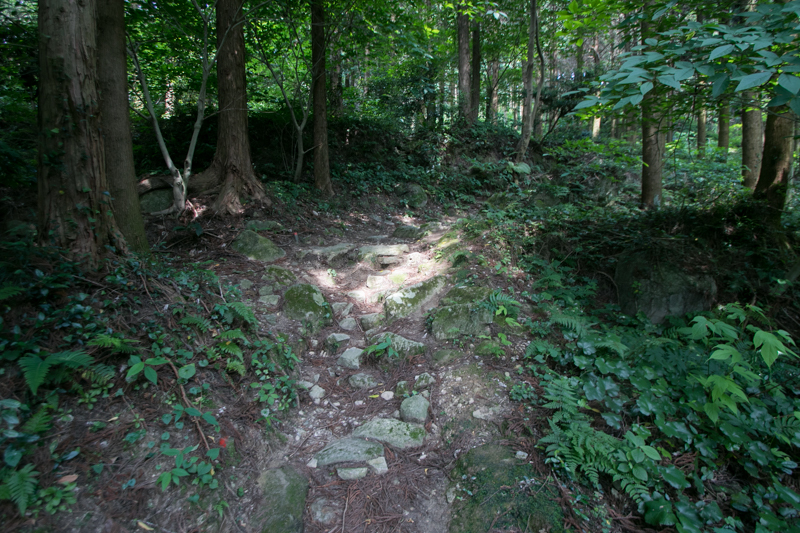 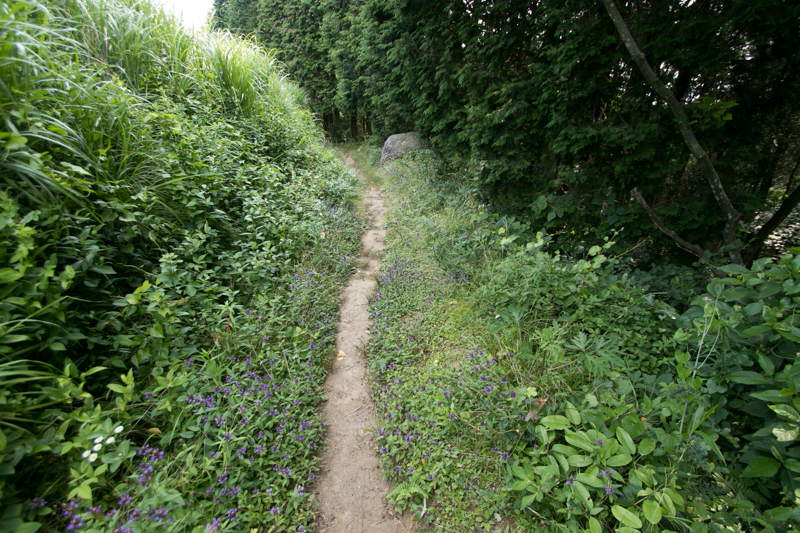 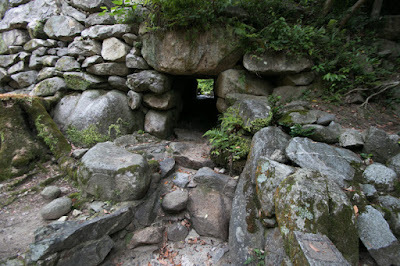 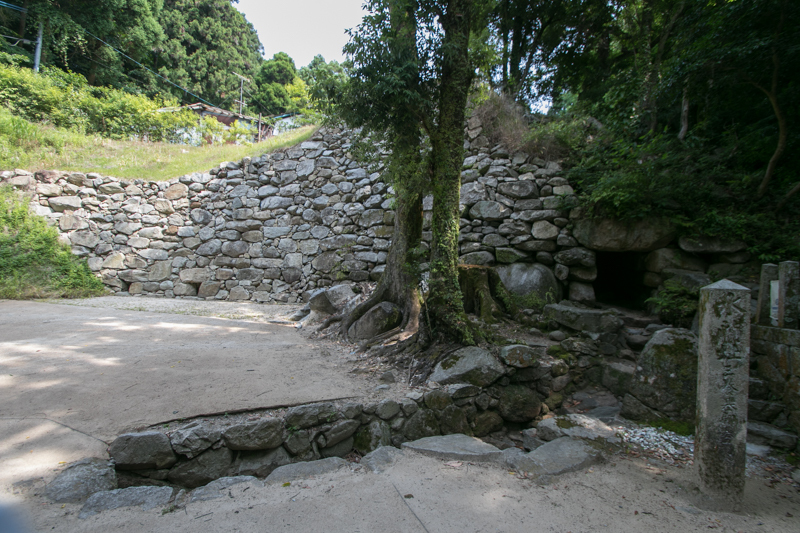 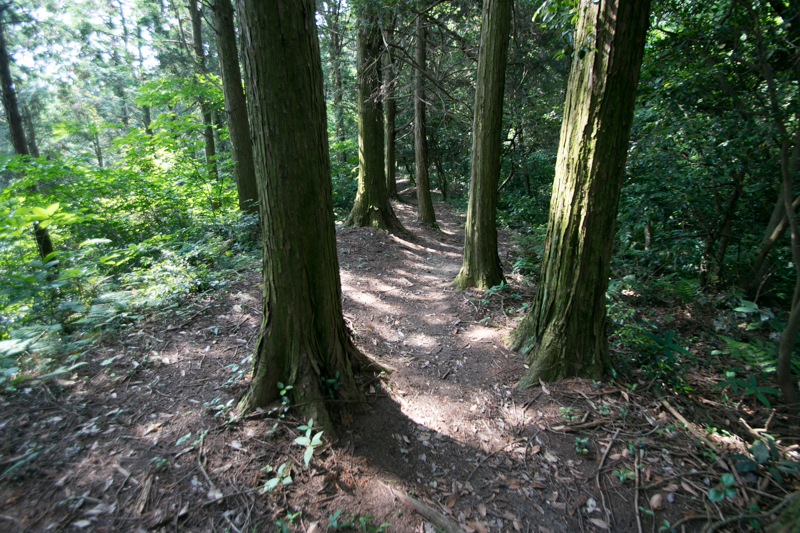 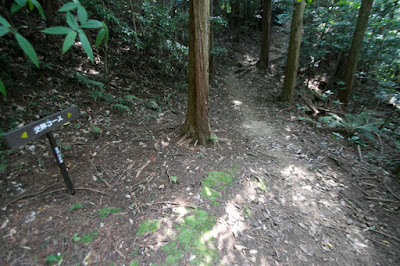 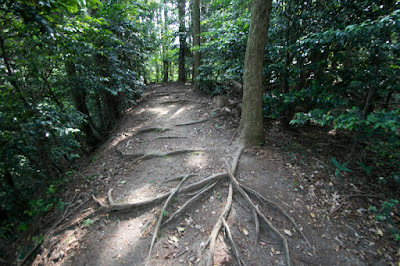 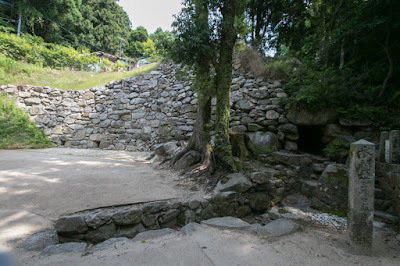 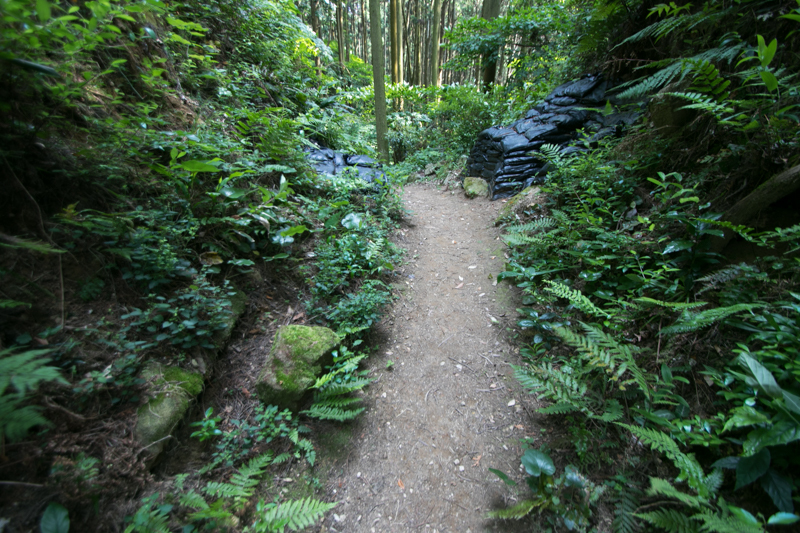 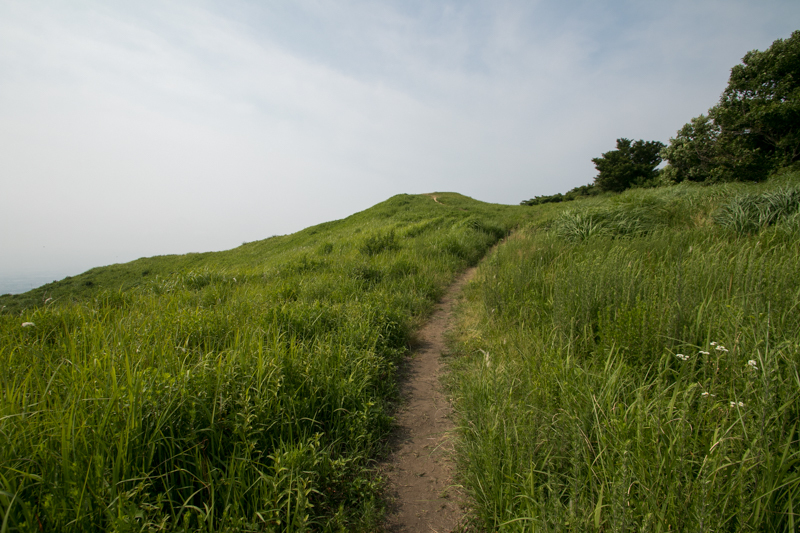 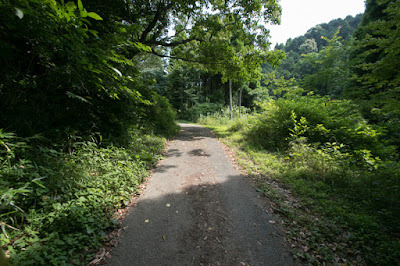 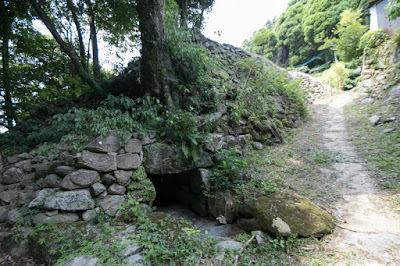 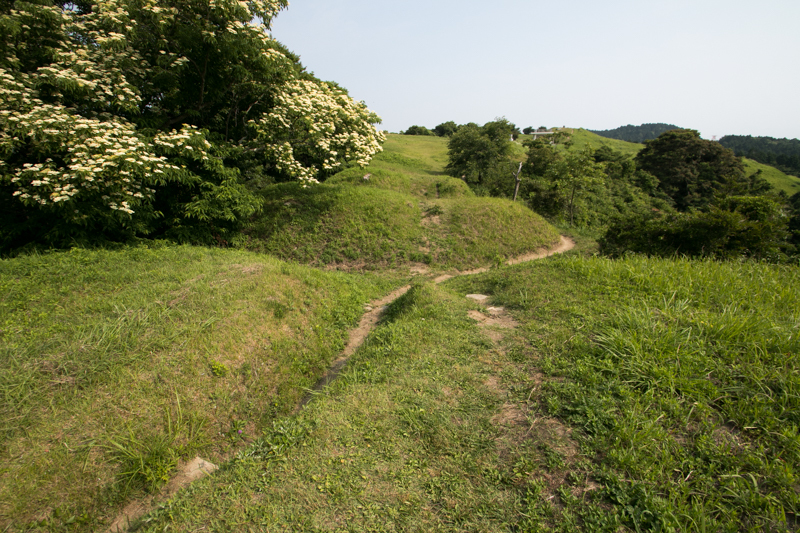 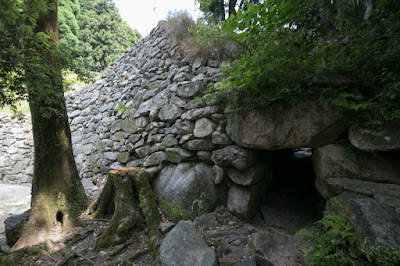 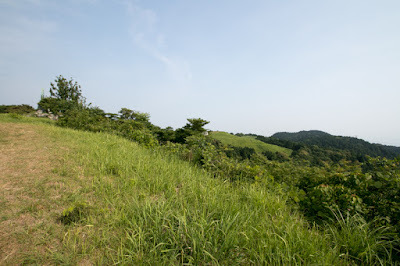 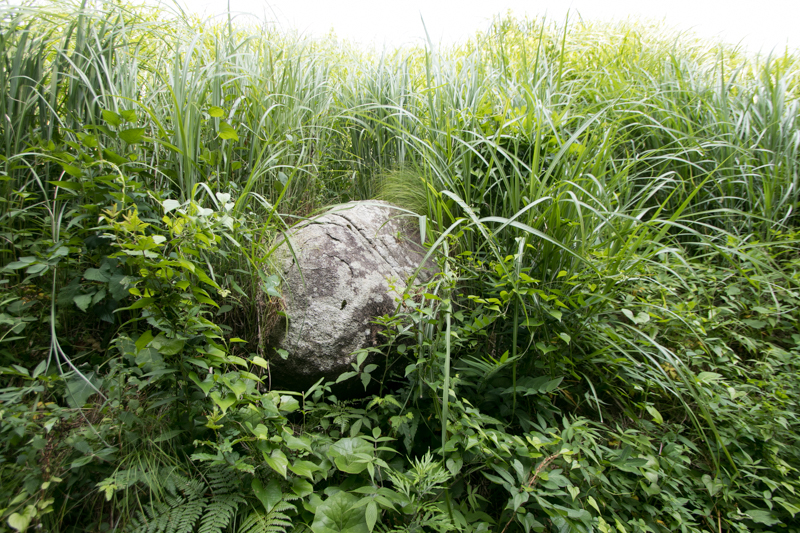 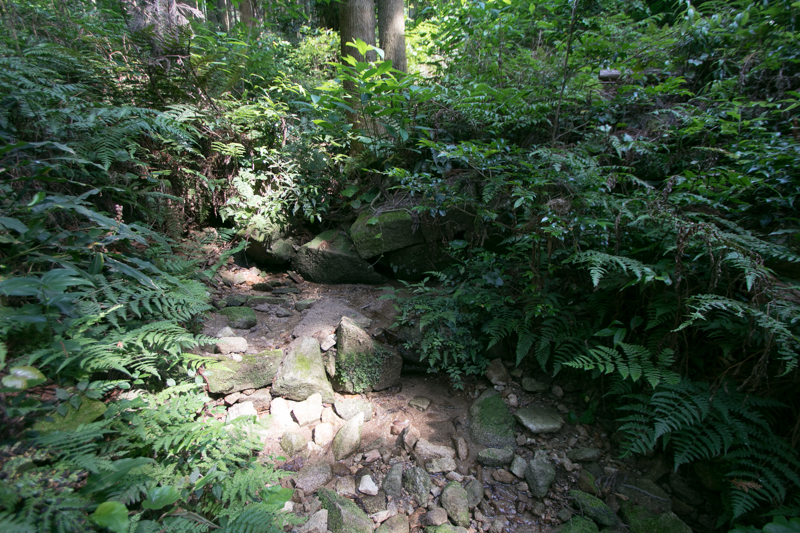 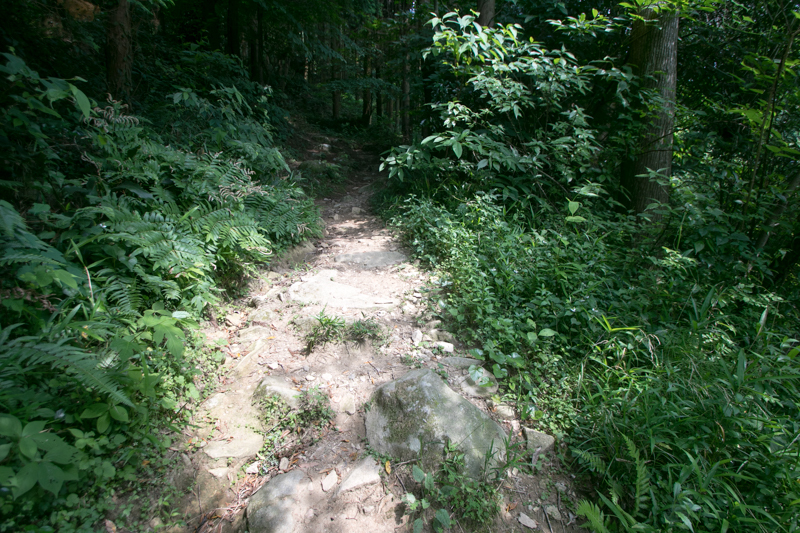 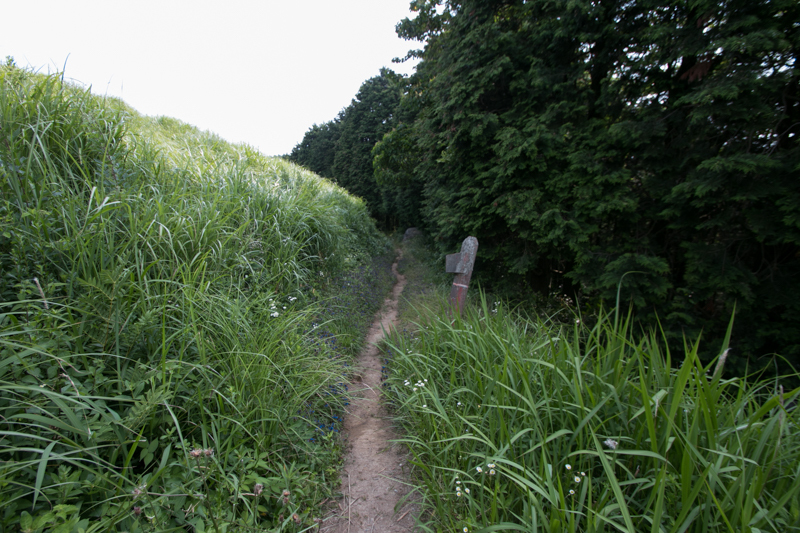 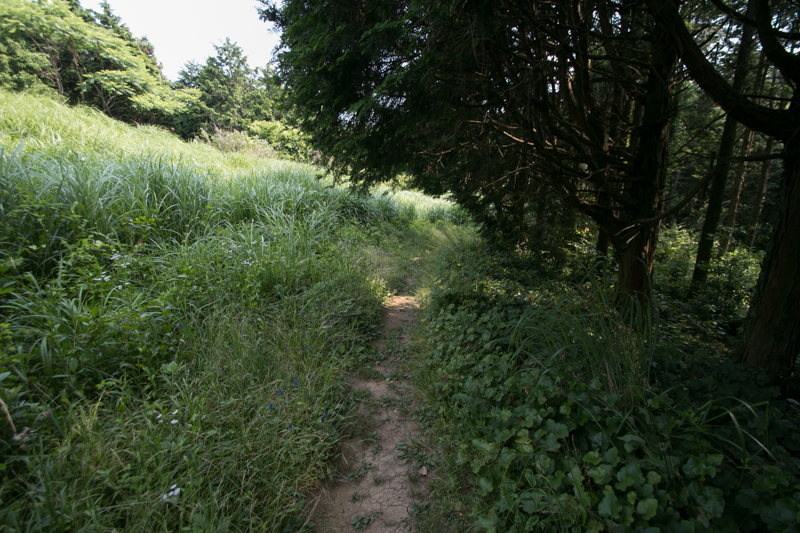 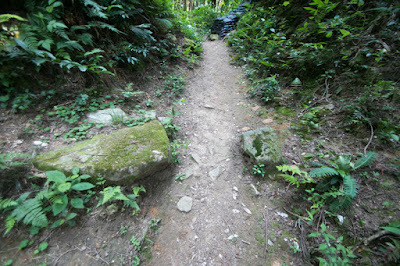 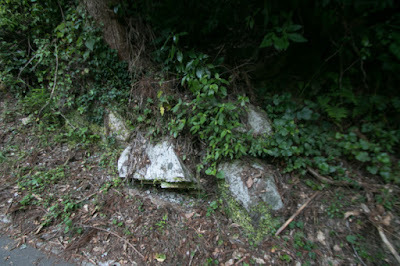 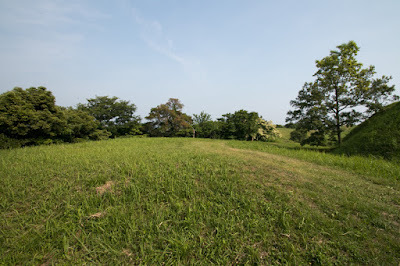 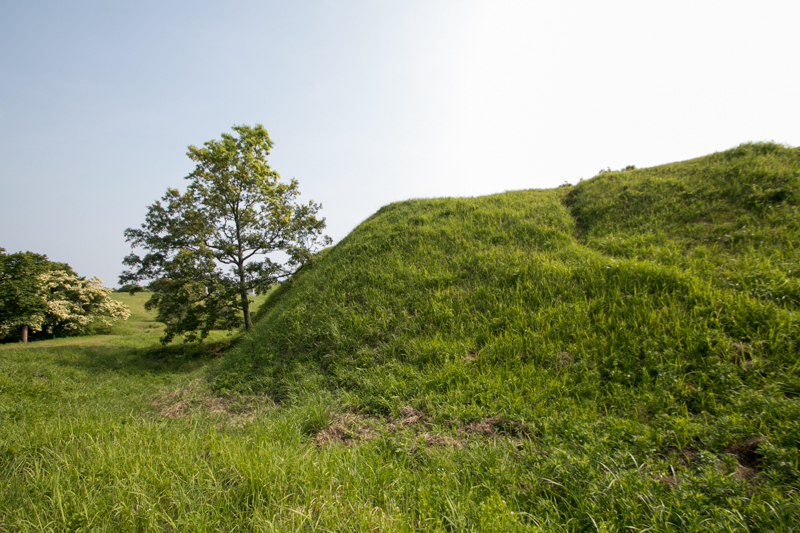 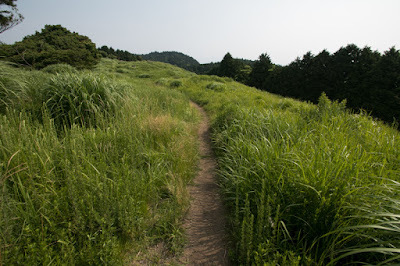 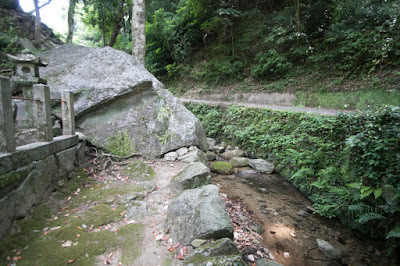 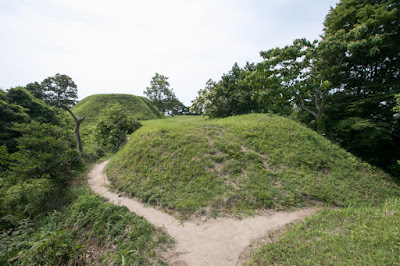 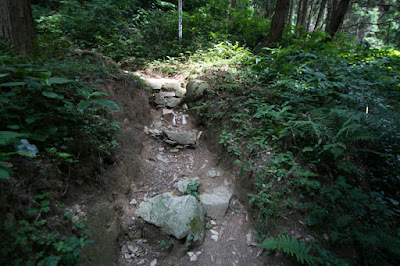 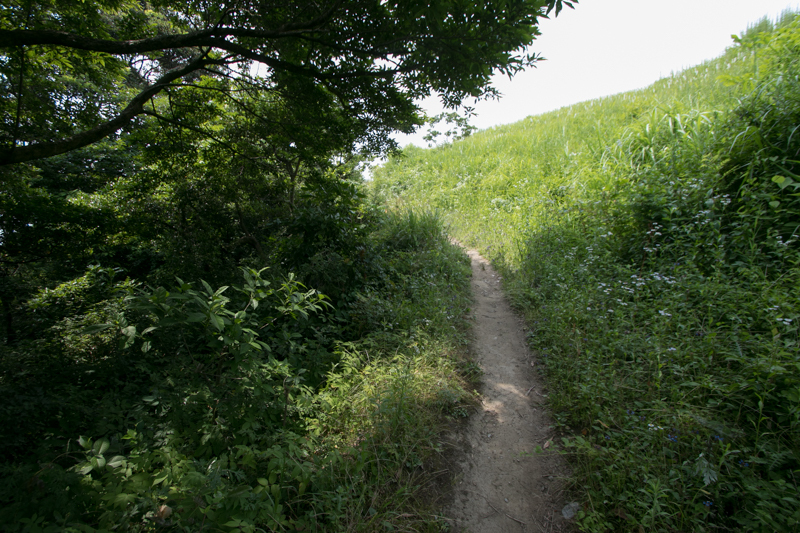 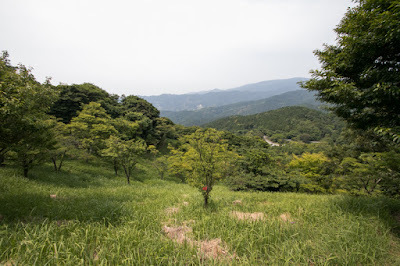 There might be another castle in pare around Katanawa-yama mountain or Aburayama mountain at the opposite of the valley, and Mizuki fort which was a line of huge clay wall and water moat shut the valley. 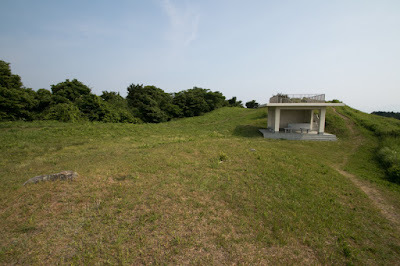 Contrary to this, at the south line, there was a same defense facilities. 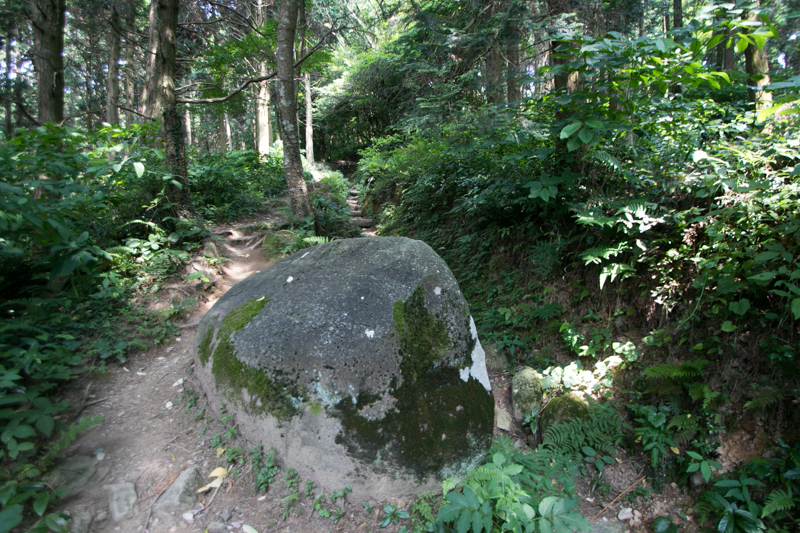 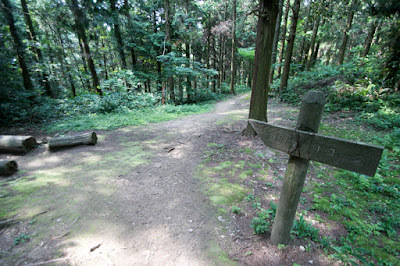 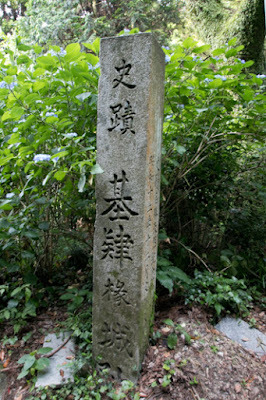 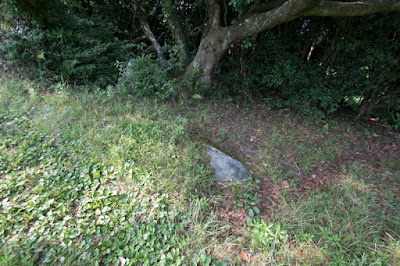 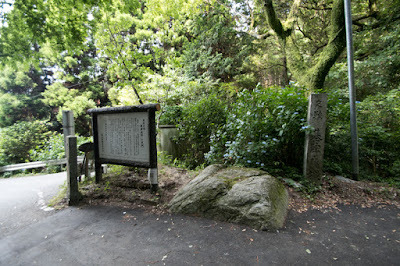 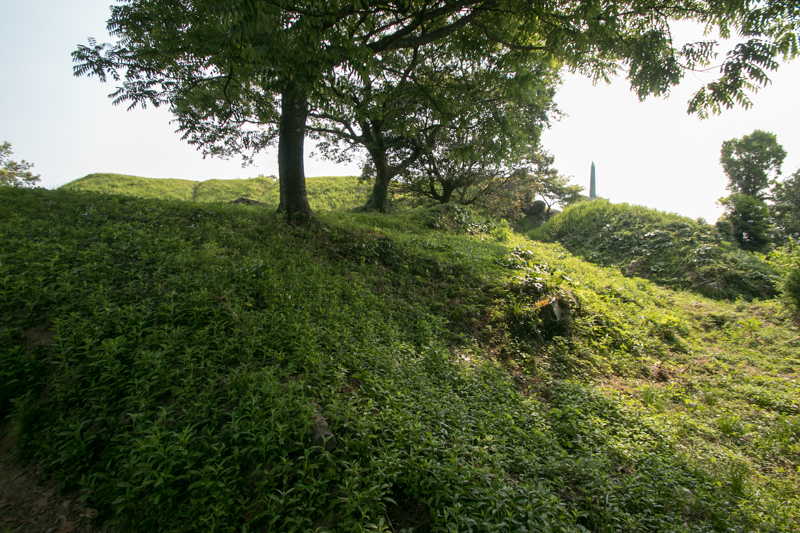 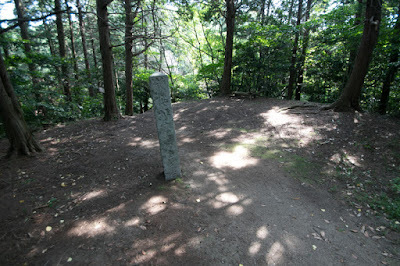 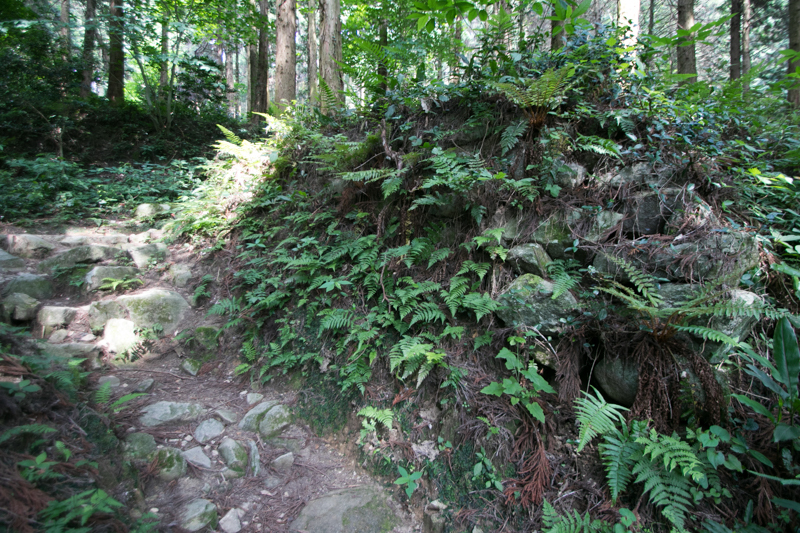 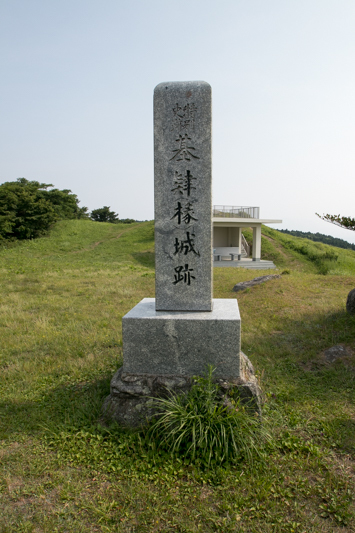 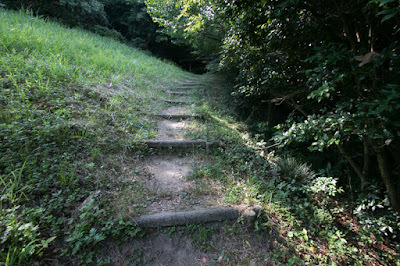 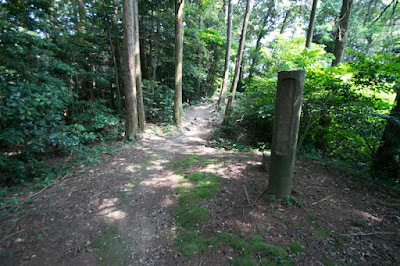 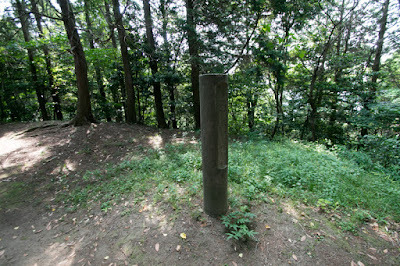 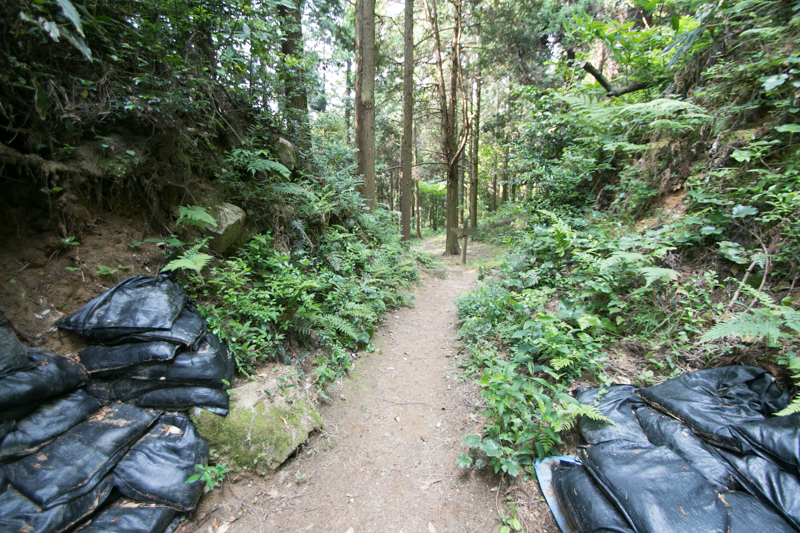 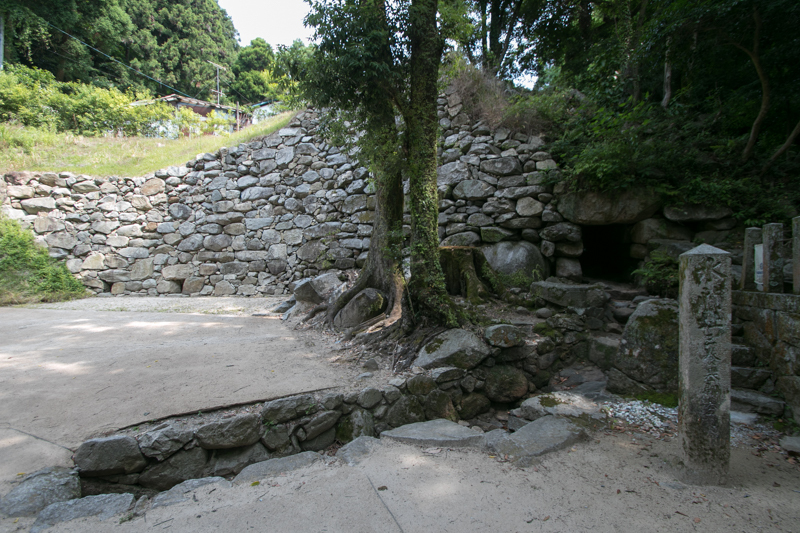 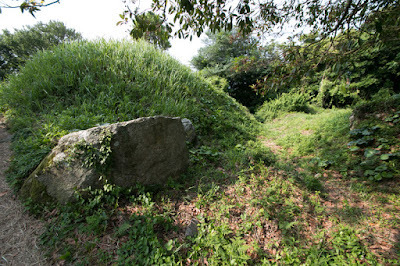 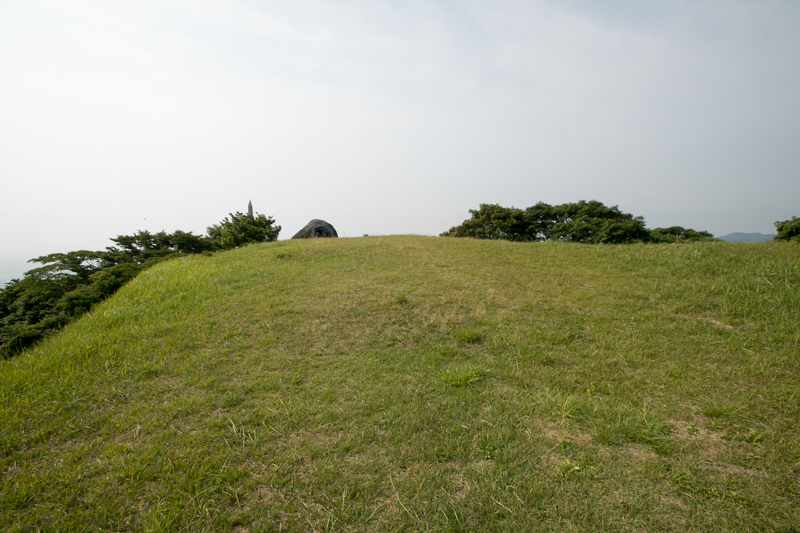 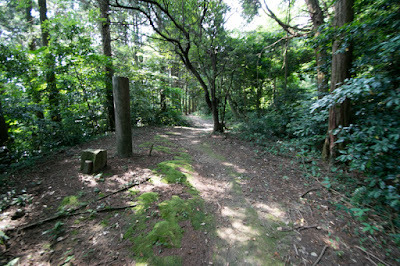 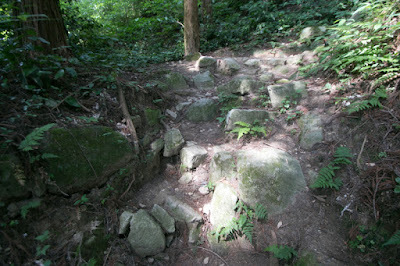 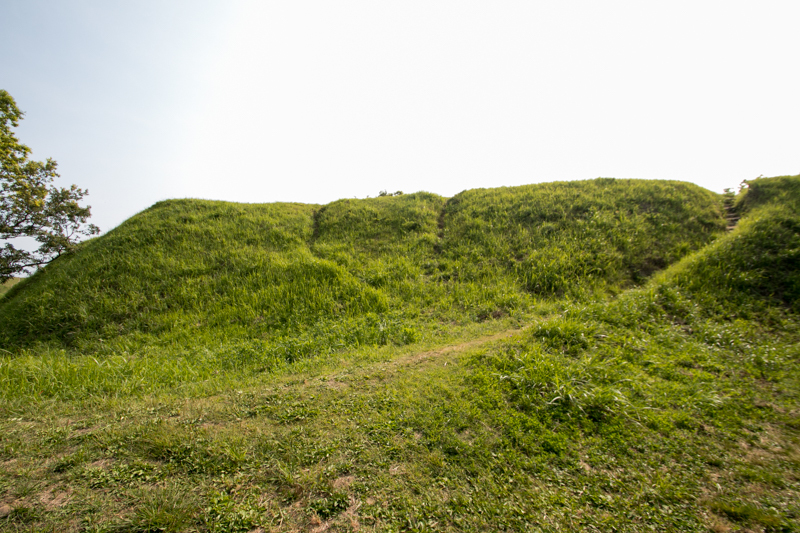 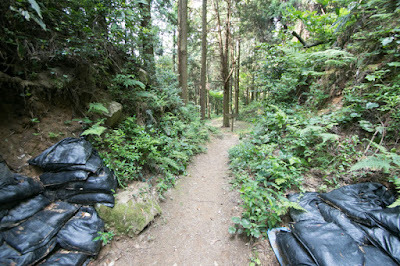 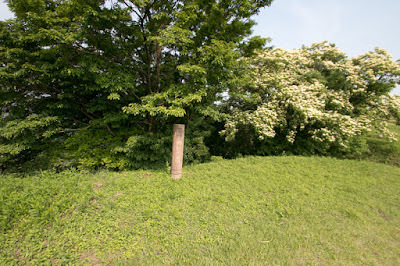 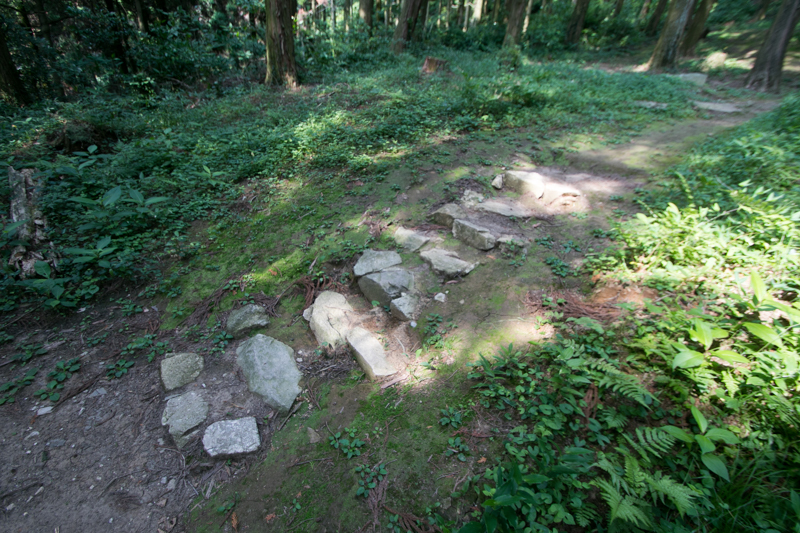 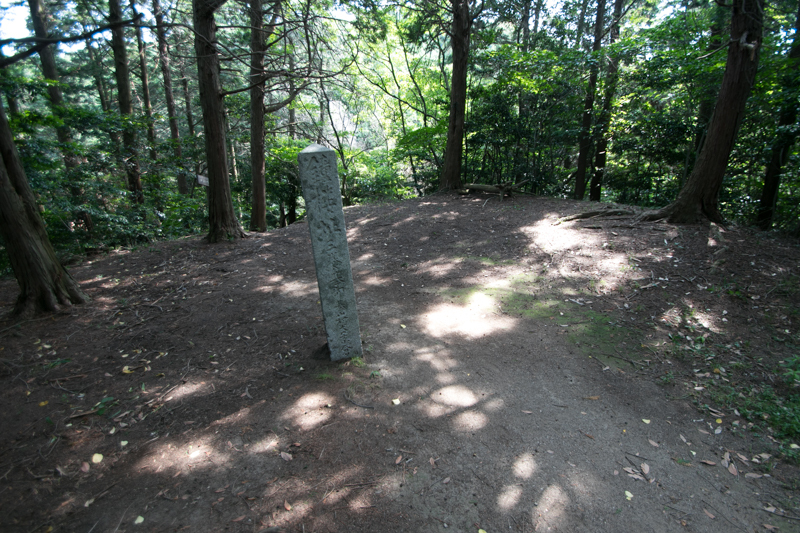 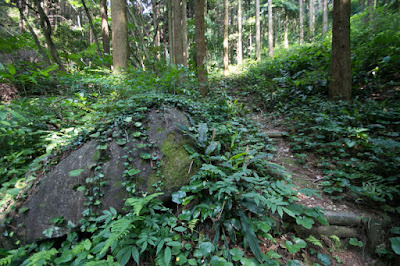 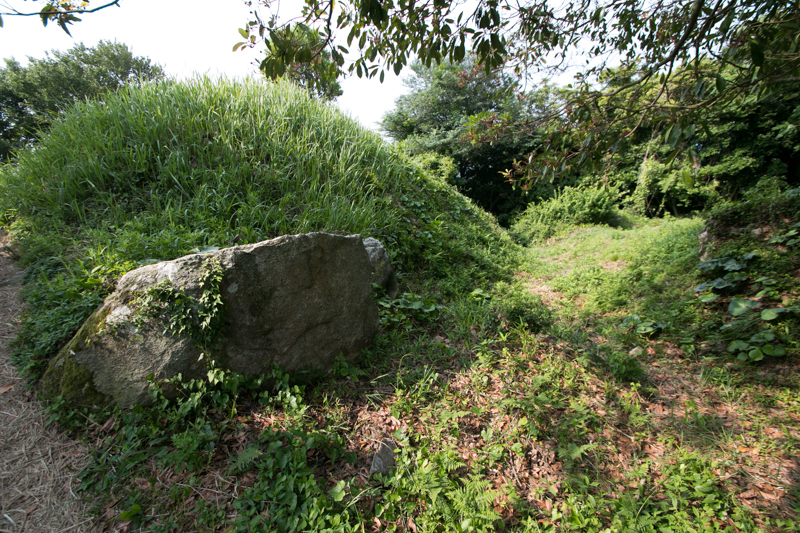 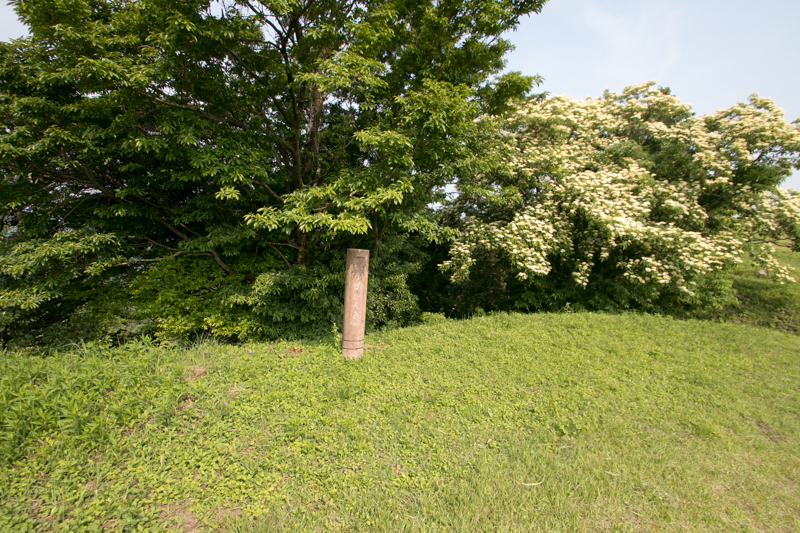 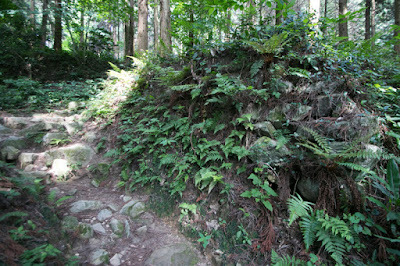 Kii castle protected the western end of defense line, and at Miyaji-dake mountain at the east edge of the line, the ruin of Ashikisan-jo was found. 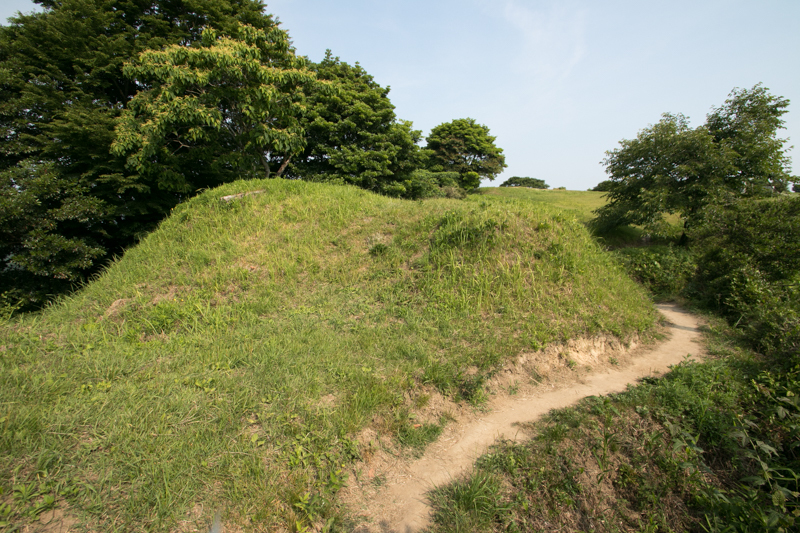 Between those two castles there slightly remains the ruin of clay wall, compared with Mizuki fort at the northward. 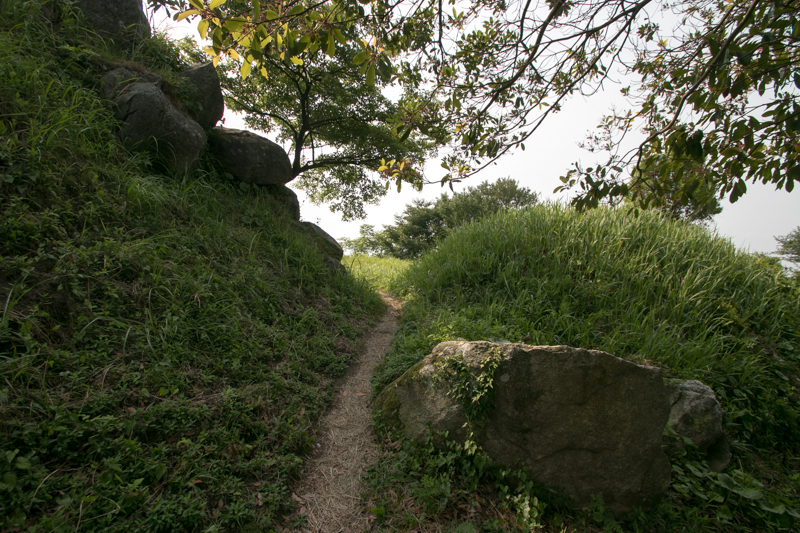 Being protected by four mountain castles and two line of clay walls, Dazaifu fort was a highly secured area prominent in ancient Japan. 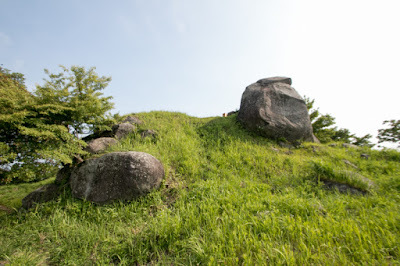 Kii castle was built by ancient Yamato dynasty in 665, along with Onojo castle and Kikuchi castle (Kumamoto prefecture). 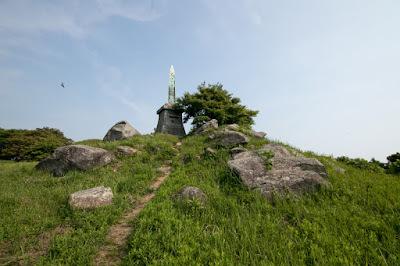 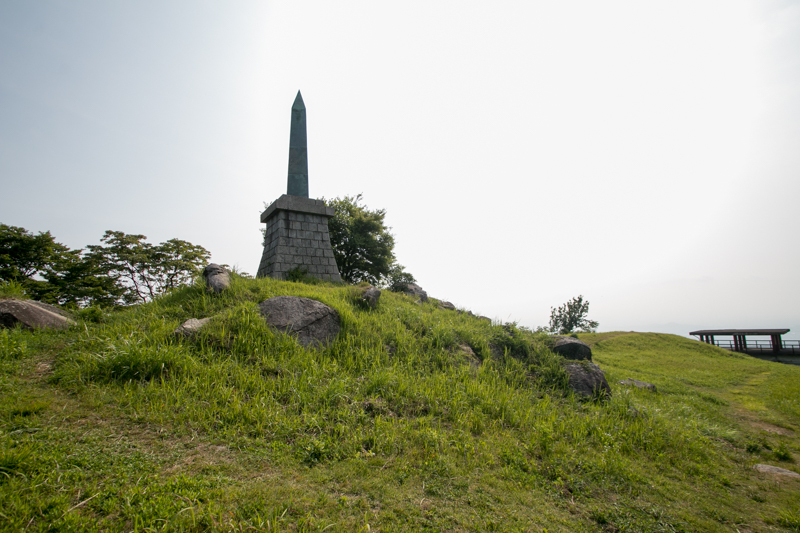 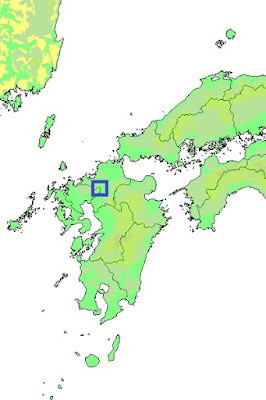 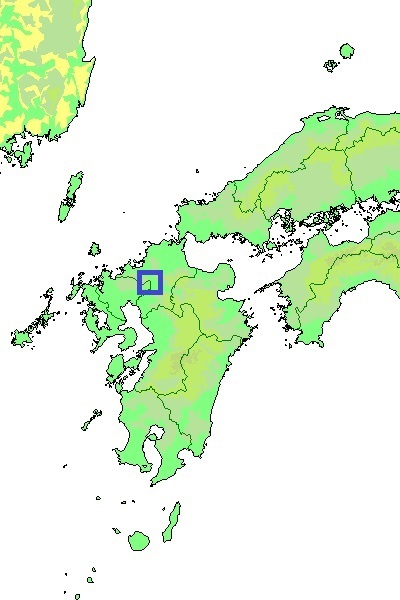 In 663, an alliance army of Yamato Dynasty and exiled Korean Beakje kingdom ruined in 660 which attempted the recovery of the Kingdom, suffered severe defeat by alliance of Korean Silla kingdom and Chinese Tang Dynasty at the battle of Baekgang, which occurred at the mouth of Geum river in southwest part of Korean peninsula. Yamato Dynasty lost many soldiers and ships, and had to seriously consider the possibility of attack to Western Japan, especially north part of Kyushu island. 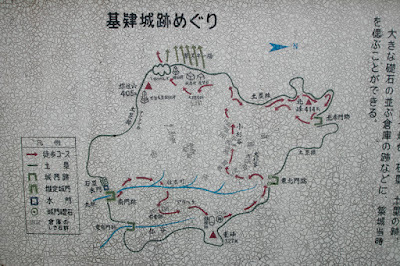 Under such situation, Yamato Dynasty had to protect Dazaifu city , the vice capital of Western Japan its local government among others, and Setonaikai Sea which is directly connected to capital area of Yamato dynasty such as Osaka area or Nara area. 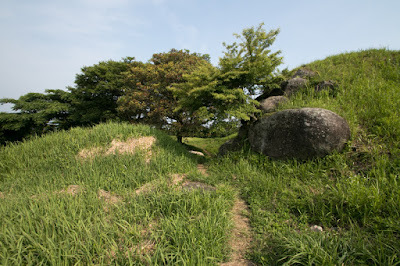 Opportunely Baekgang kingdom was extinguished and many refugees including castle engineers came to Japan, Yamato Dynasty build many Chosun style mountains castles such as Onojo castle, Kii castle (Fukuoka prefecture), Kinojo castle (Okayama prefecture), Kikuchi castle (Kumamoto prefecture), Yashima castle (Kagawa prefecture) and Takayasuyama castle (Osaka prefecture) around north part of Kyushu island and coast of Setonaikai sea, expected invasion rate by foreign country to the capital using coast fleet. 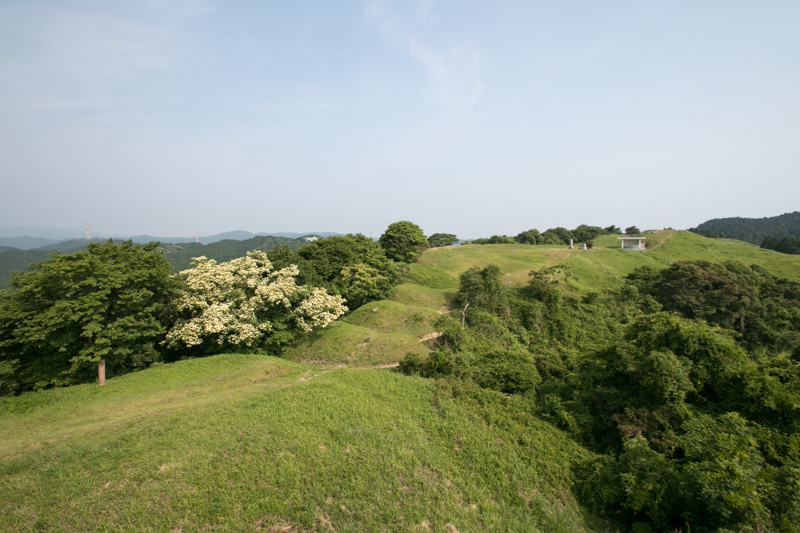 Kii castle was built utilizing the valley spreads from hilltop area toward south and formed like a horseshoe surrounds the valley. From the top of the mountain, two line of tall clay walls were built along the ridge at the both side of the valley, and both line of clay walls meet at the water gate which is built at the exit of the valley. 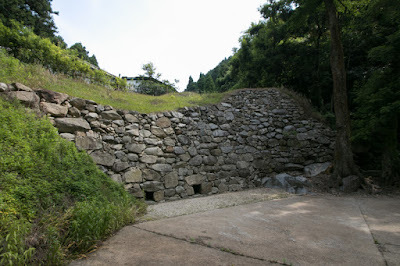 Interestingly Onojo castle and Ashikisan-jo castle have the same structure. 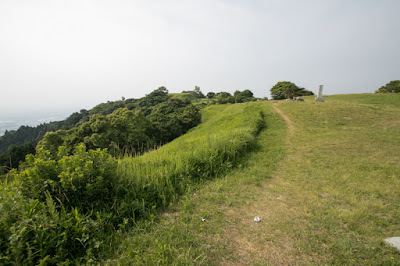 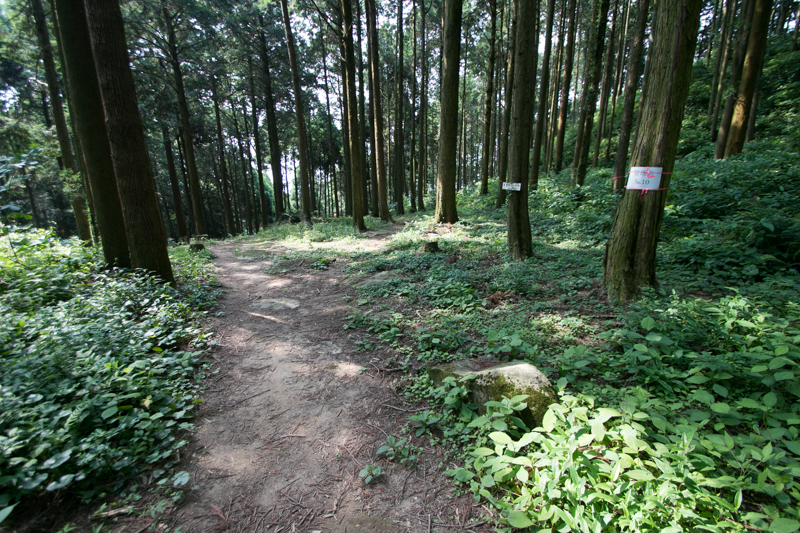 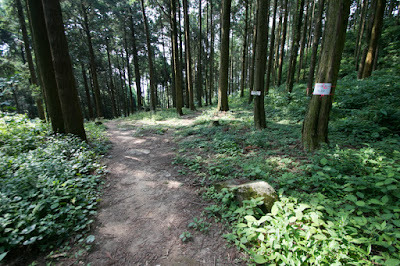 Considering to resist against foreign army long time, the ideal place of the castle is a table mountain like castle has a flat hilltop area and sheer cliff around the flat area. 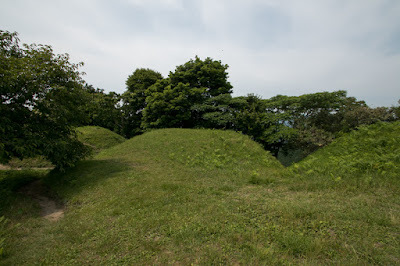 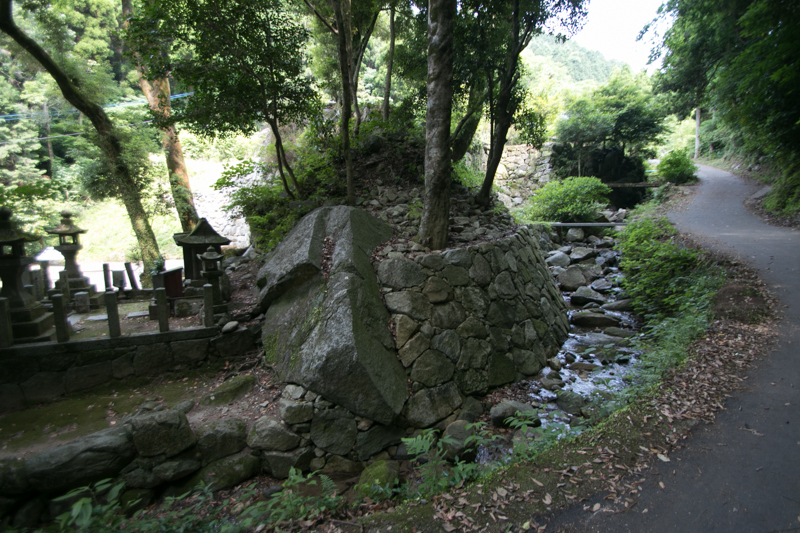 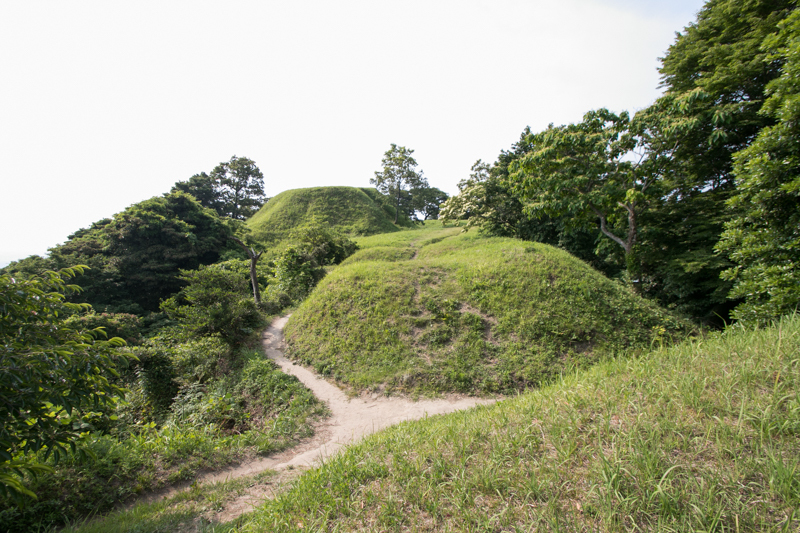 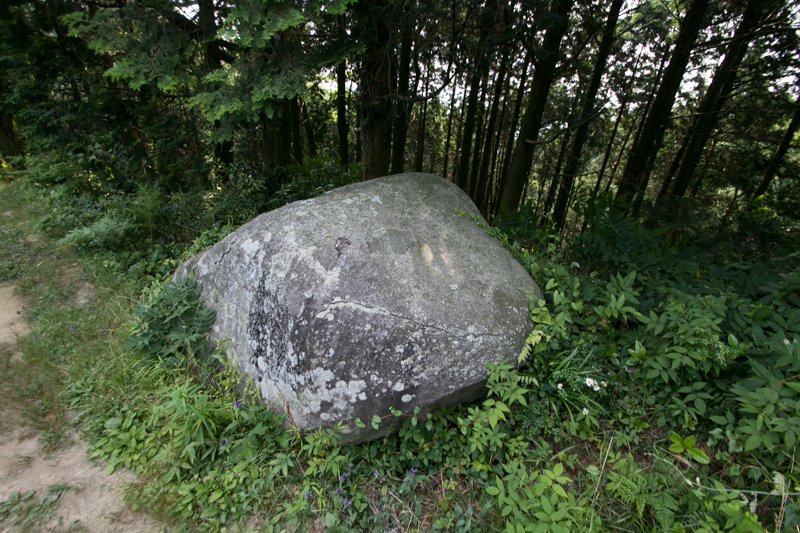 Among ancient castles, Kinojo castle, Yashima castle or Takayasuyama castle have such shape. 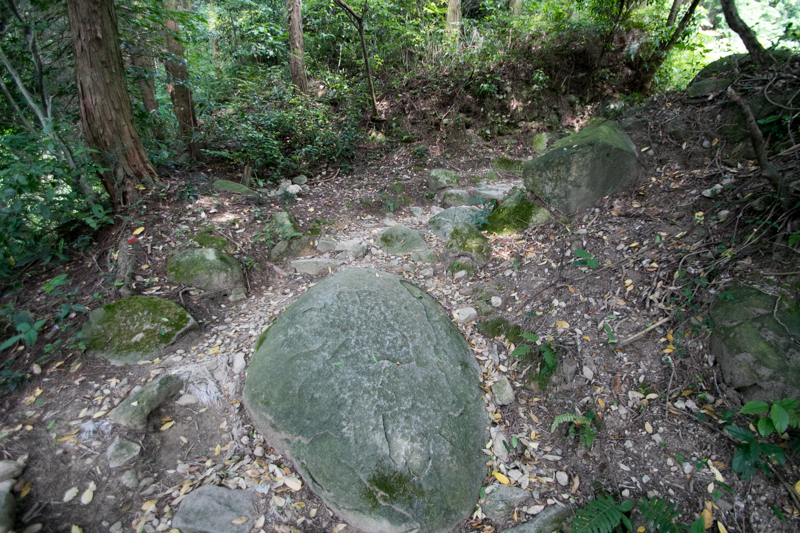 However, mountains surround Dazaifu fort did not have such shape, thus as a second best, this type of horseshoe shape might be adopted. But as a matter of course, hillside water gate become a serious weak point of the castle. 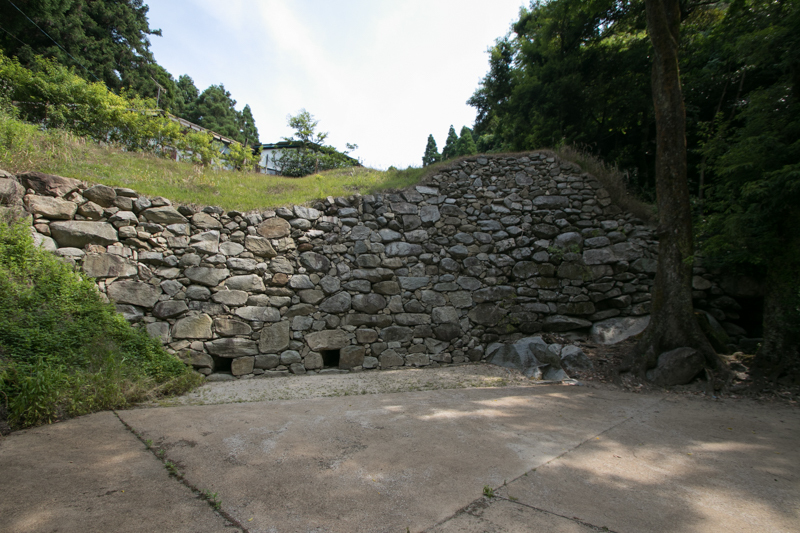 To prevent the intrusion of enemy from this side, this type of horse shoe shaped castle built a tall stone walls equivalent to modern castles at this point. 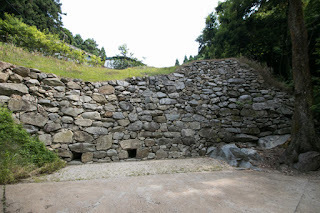 Kii castle had a line of stone wall which is over 5 meter tall and 25 meter long at this point, with the lines of draining lines. 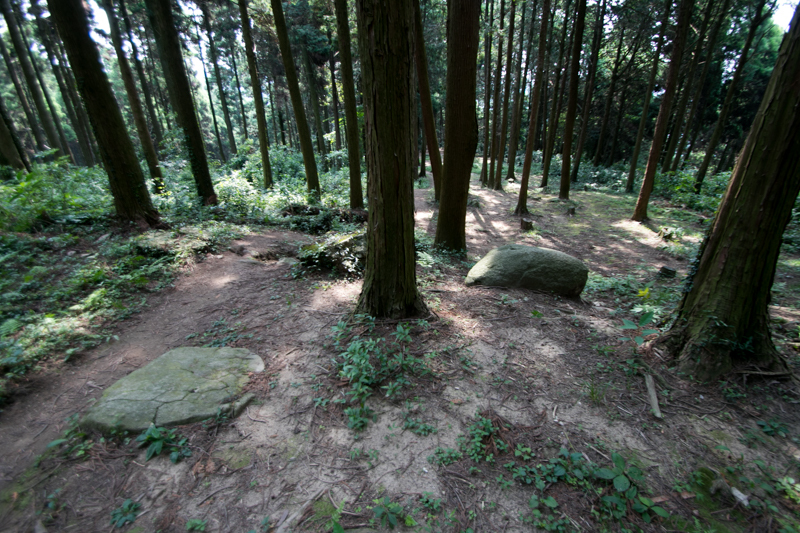 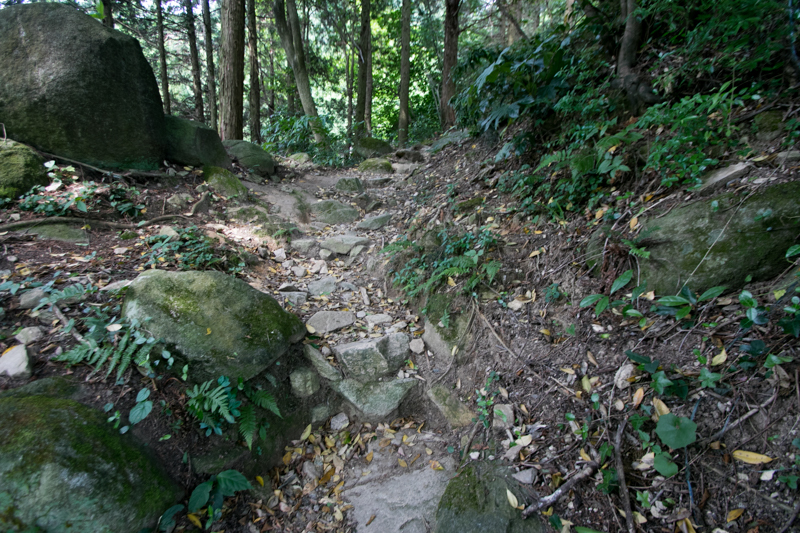 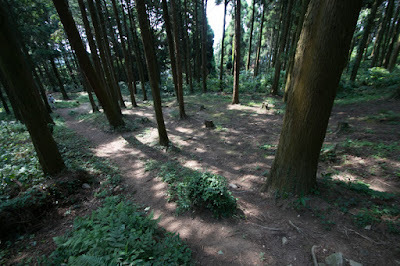 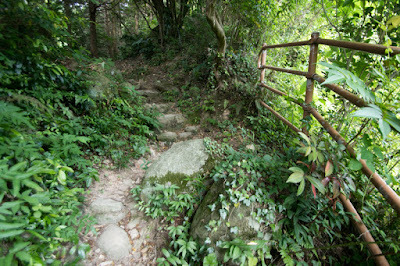 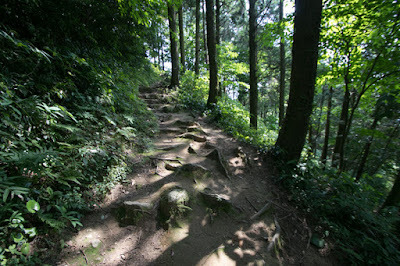 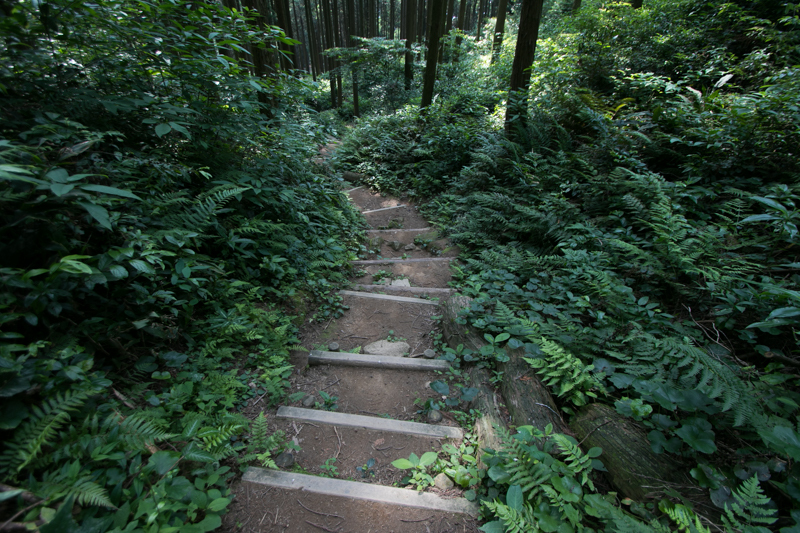 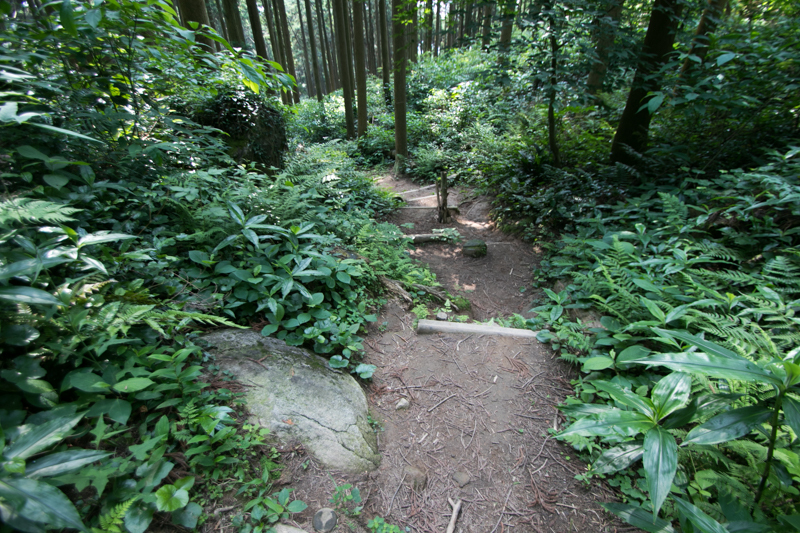 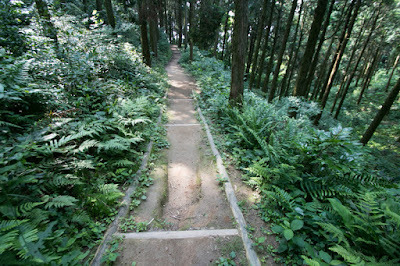 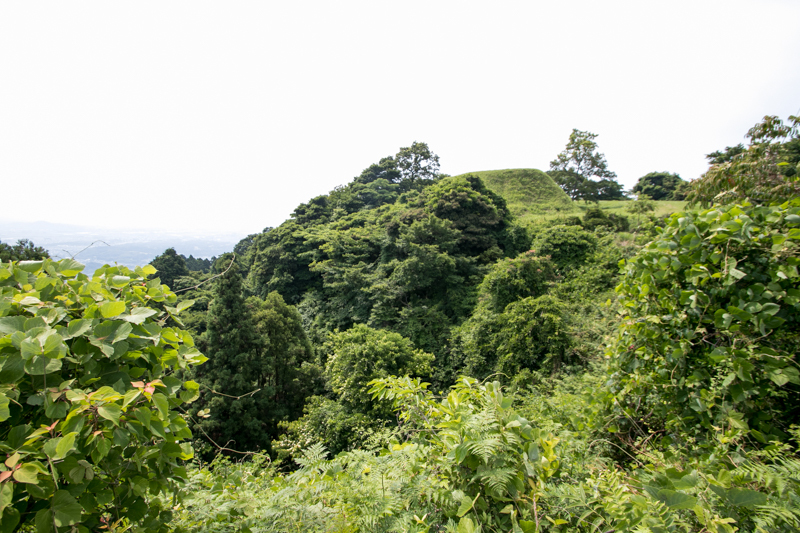 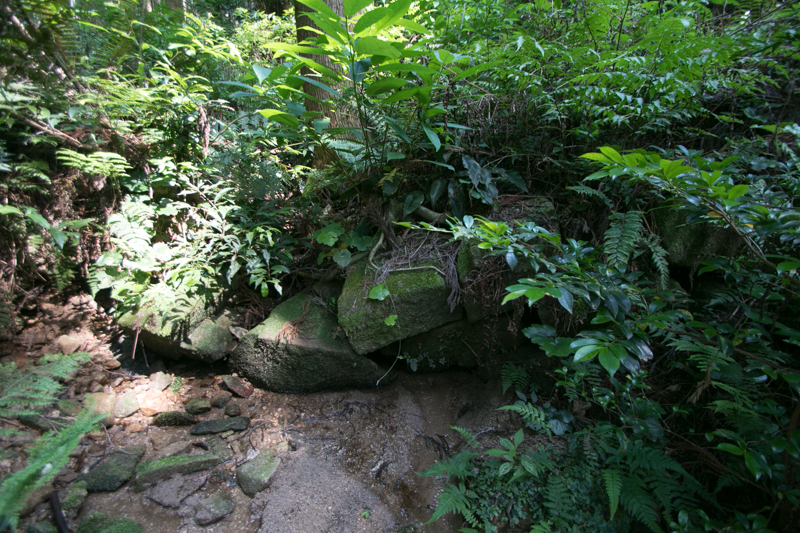 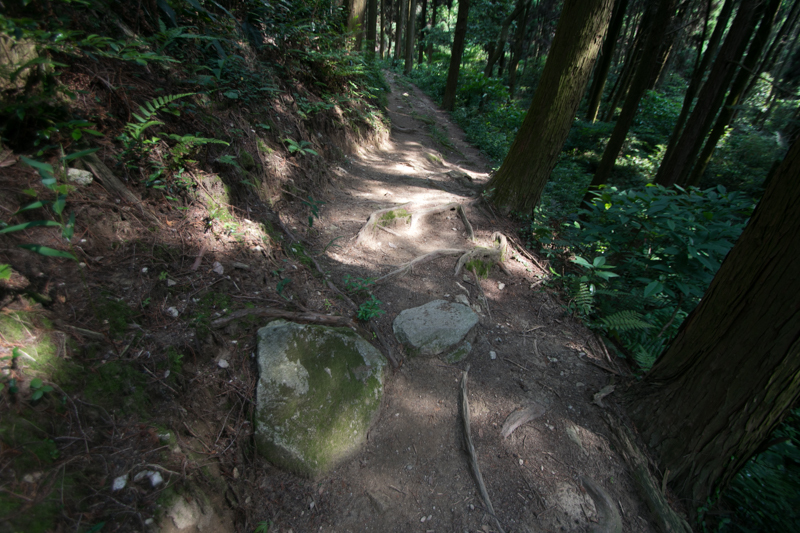 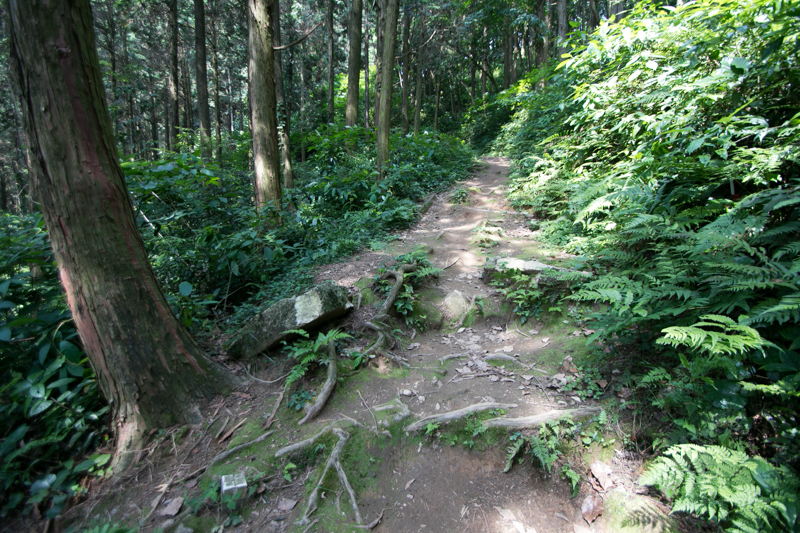 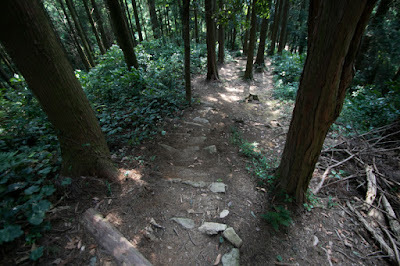 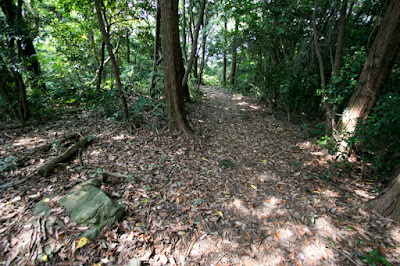 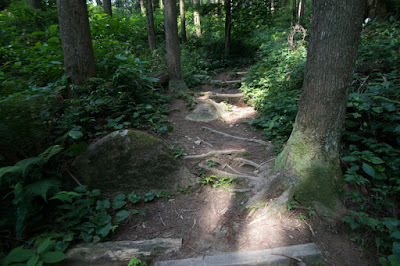 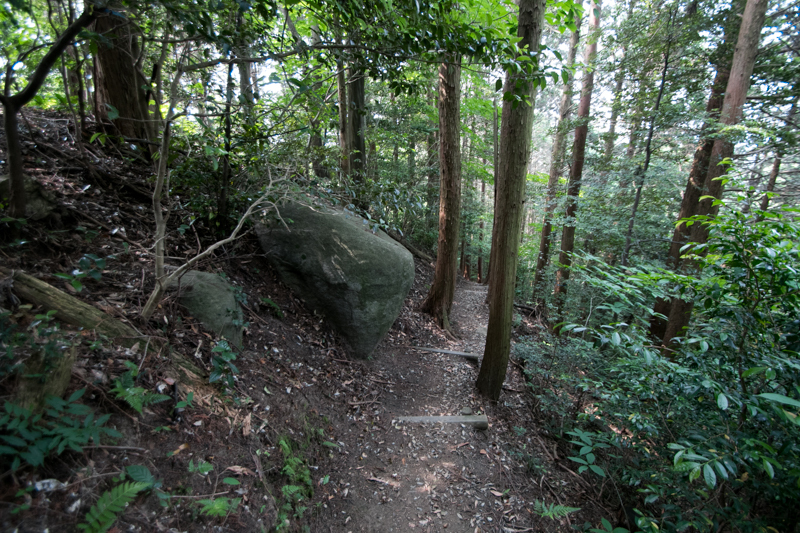 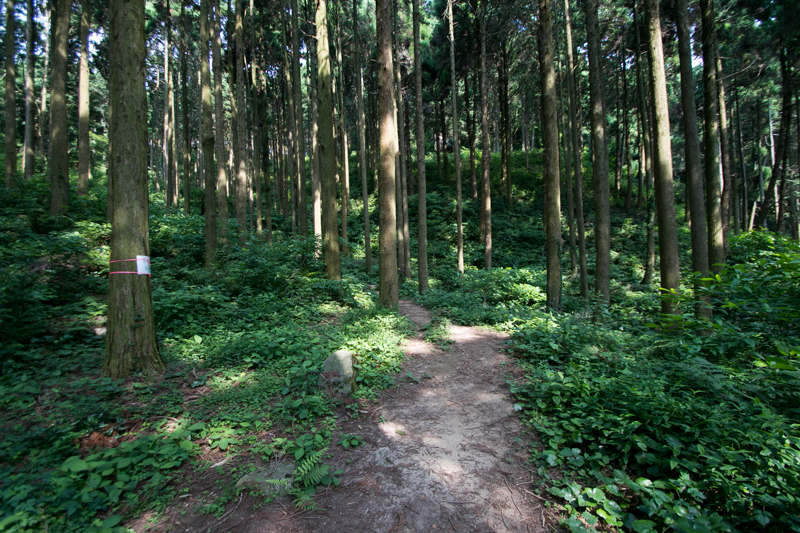 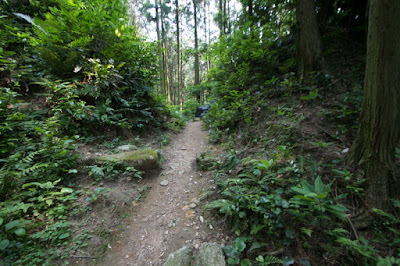 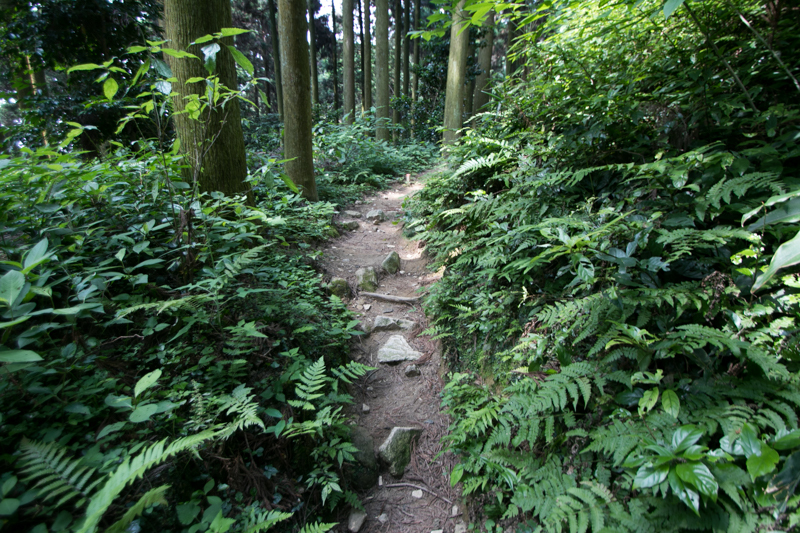 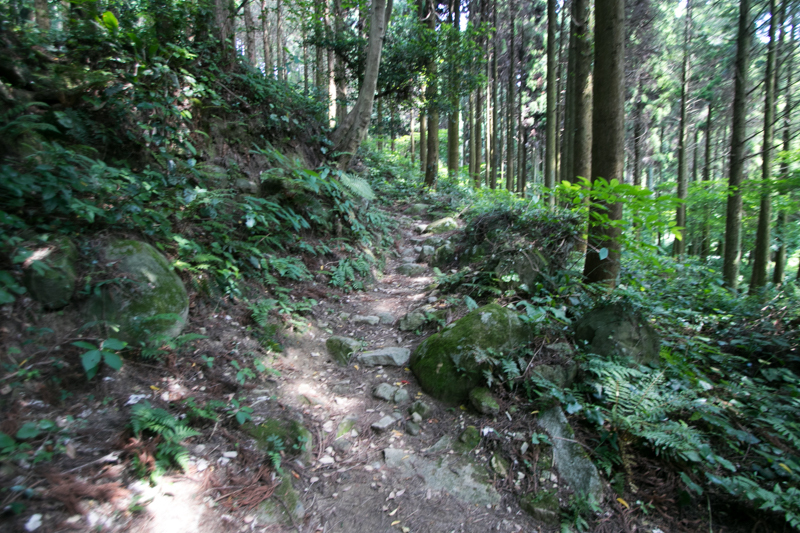 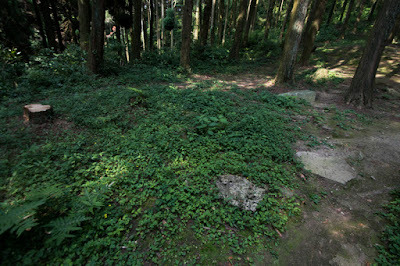 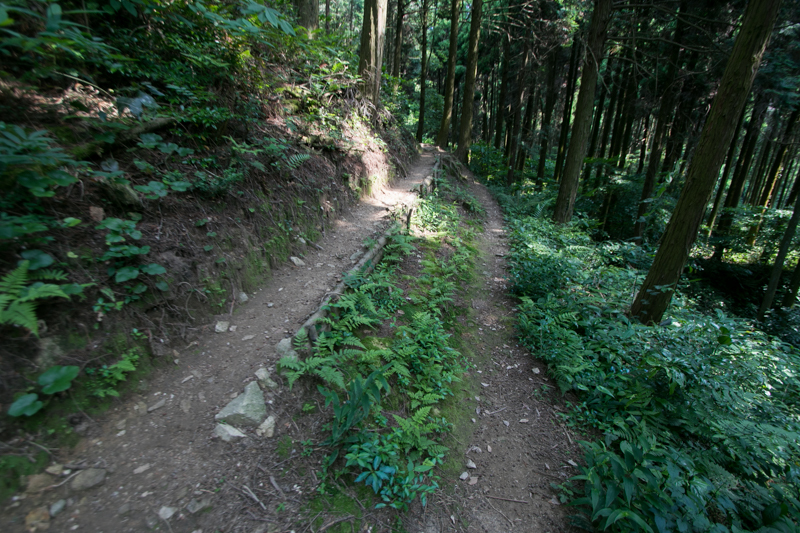 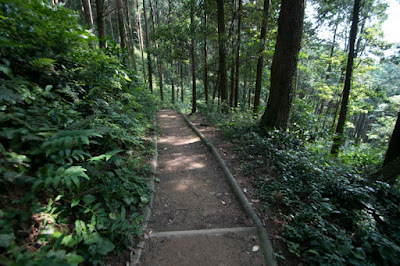 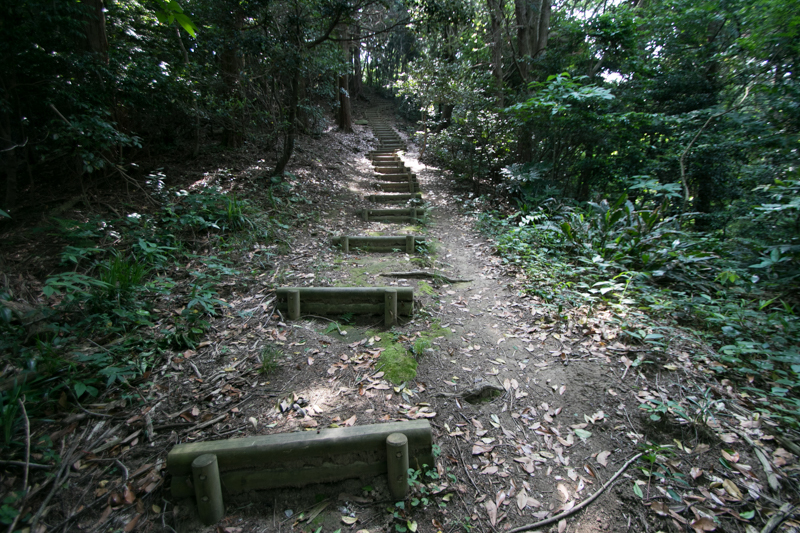 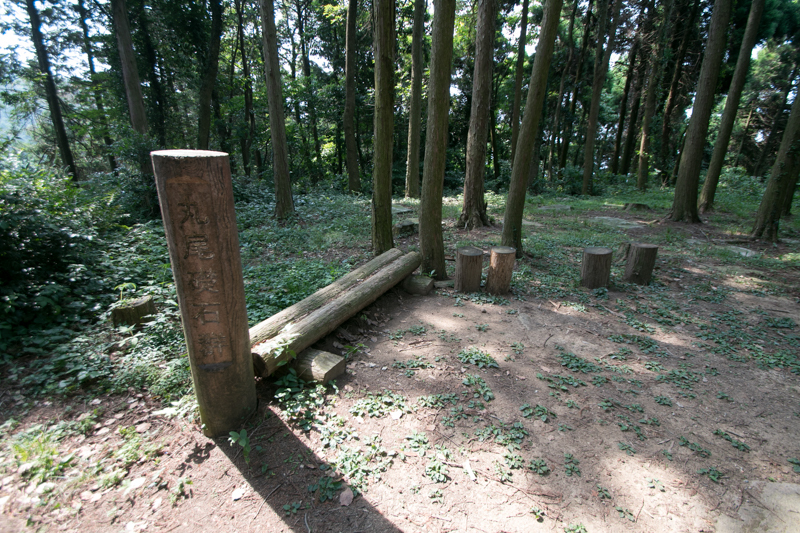 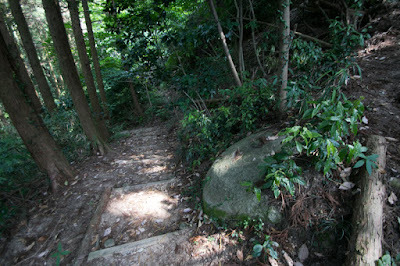 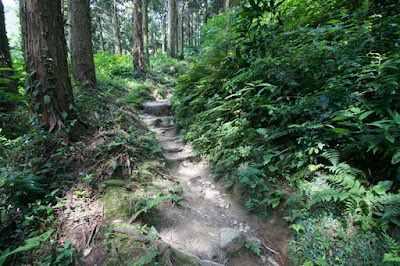 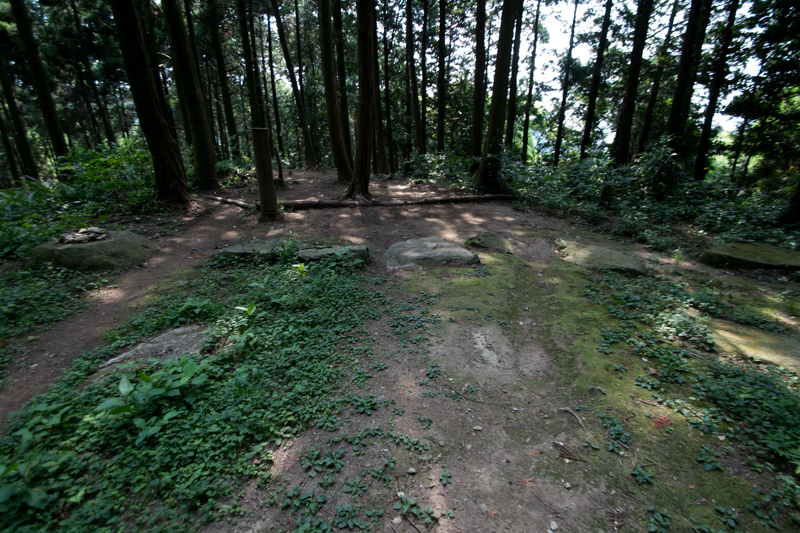 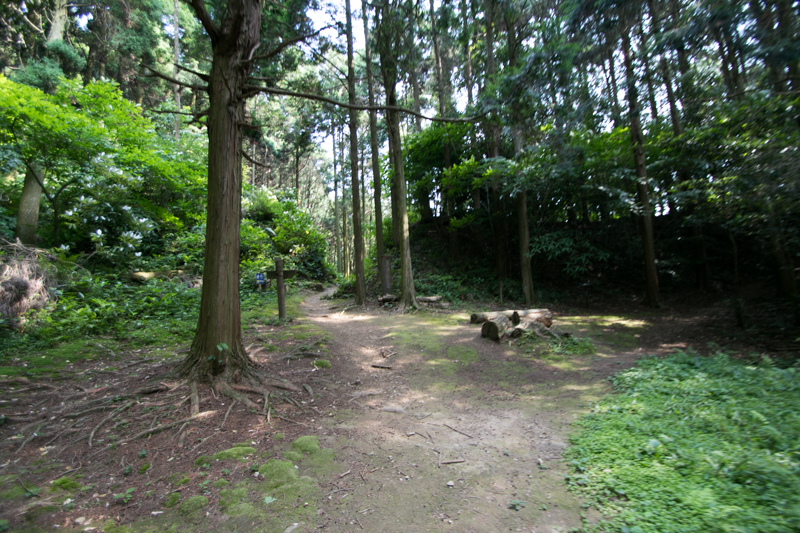 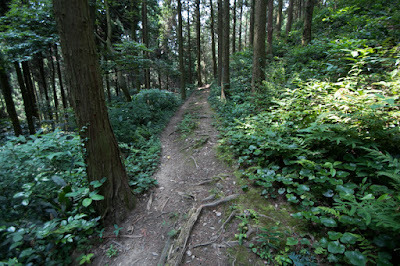 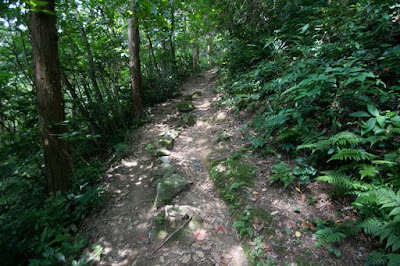 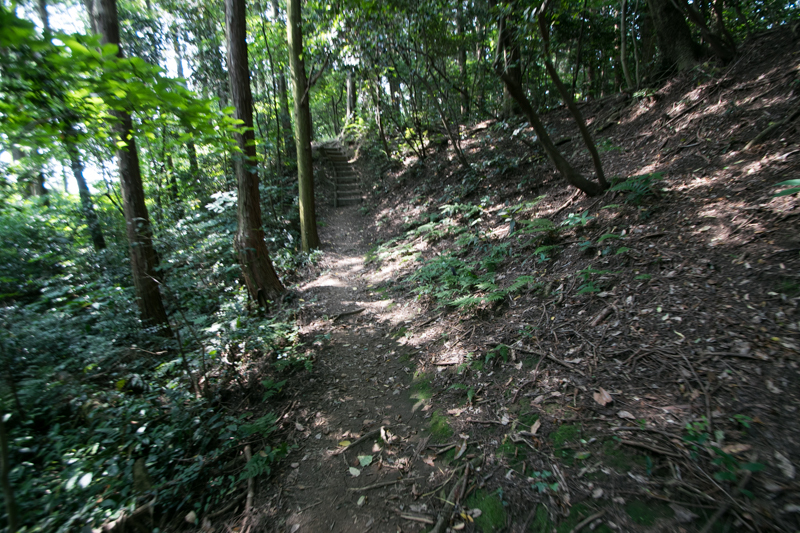 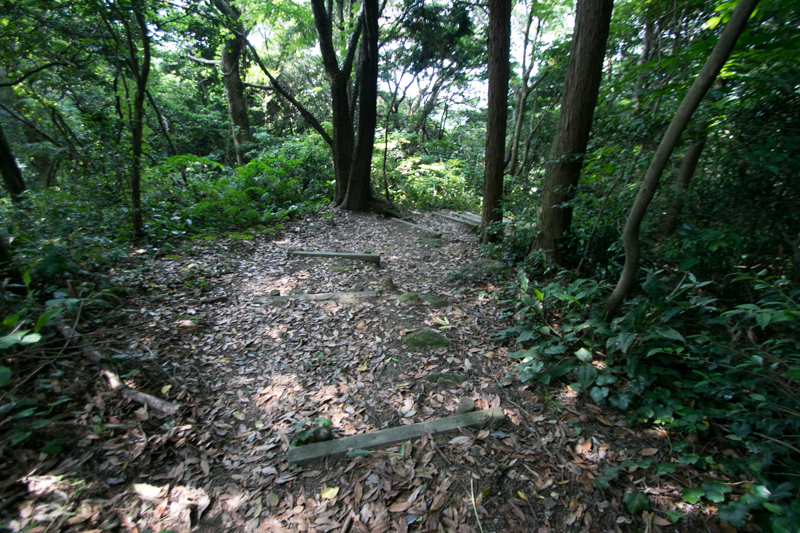 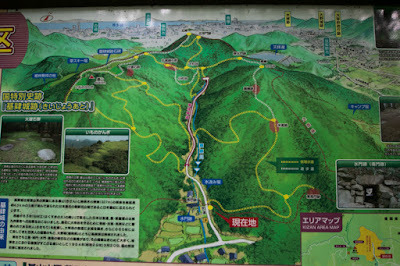 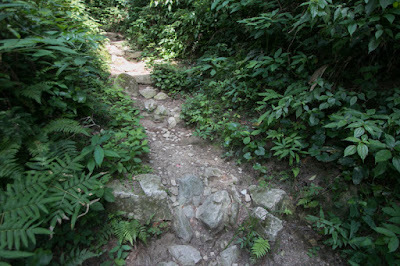 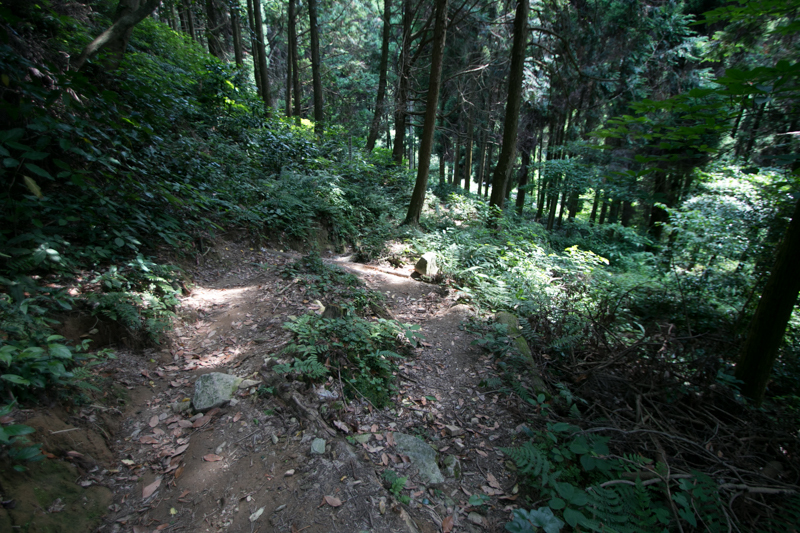 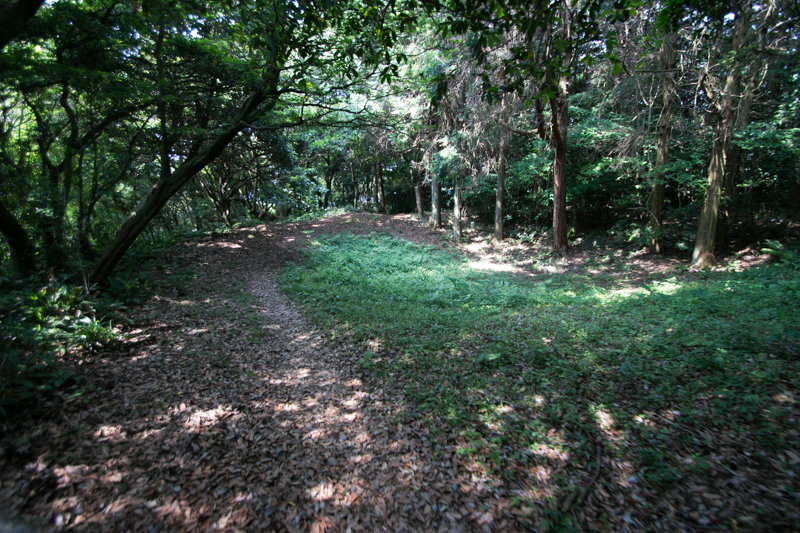 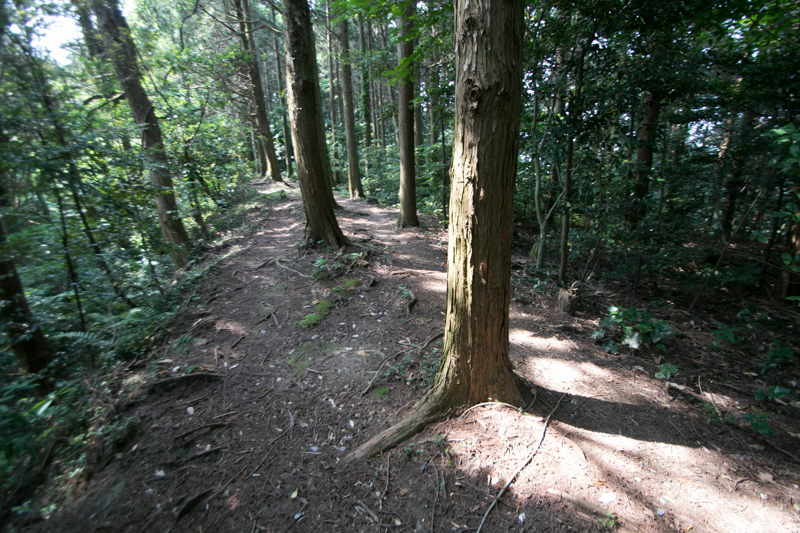 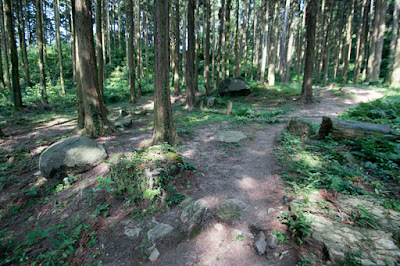 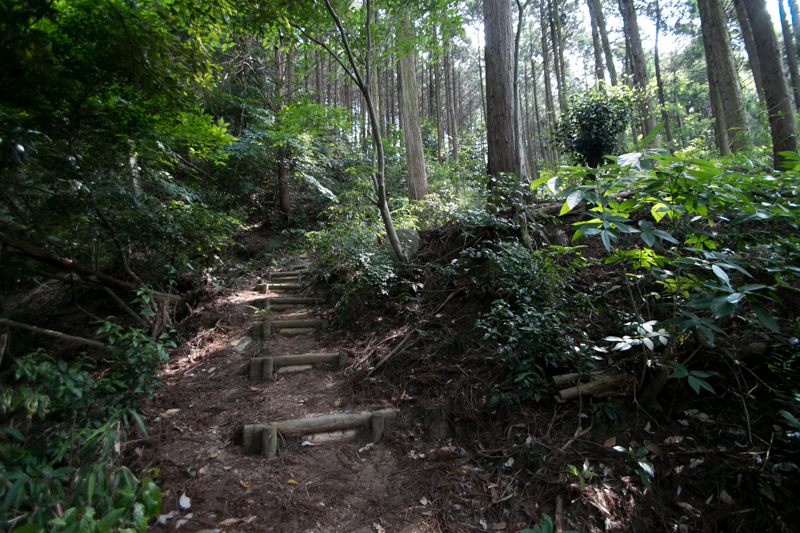 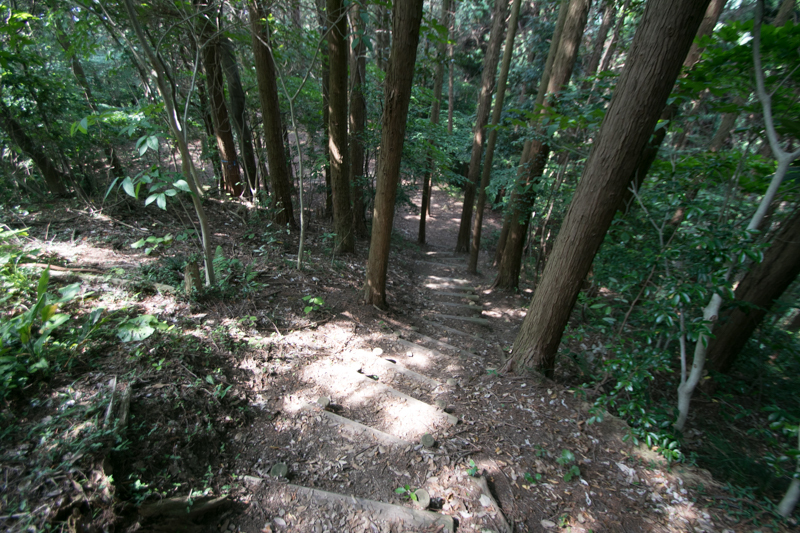 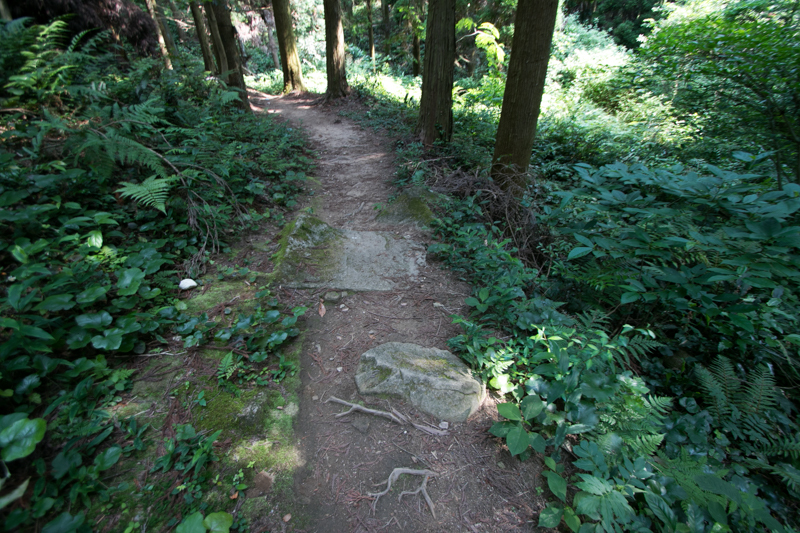 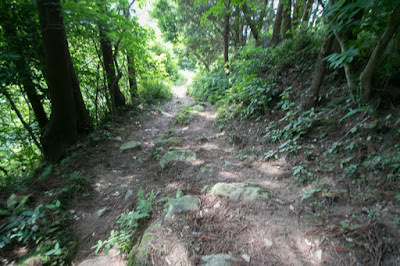 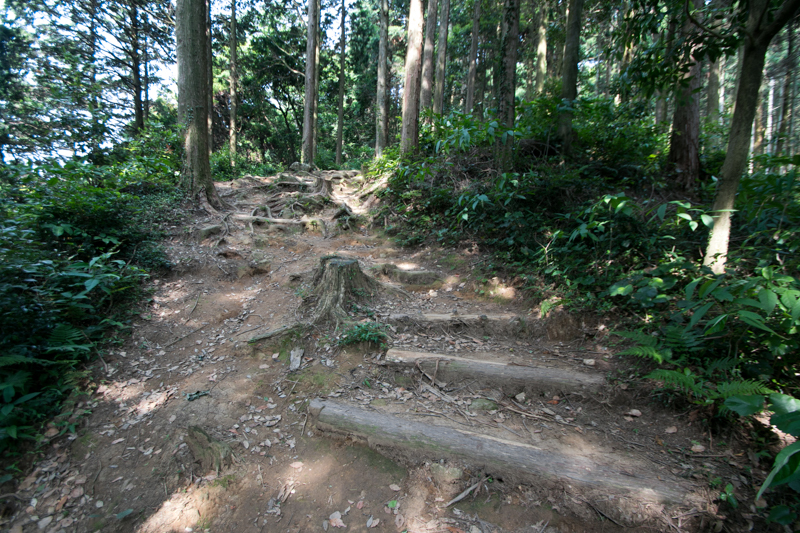 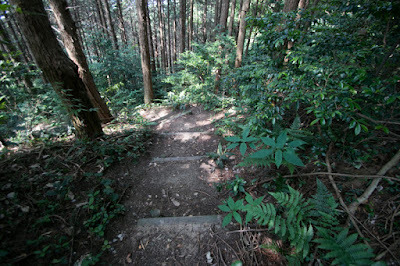 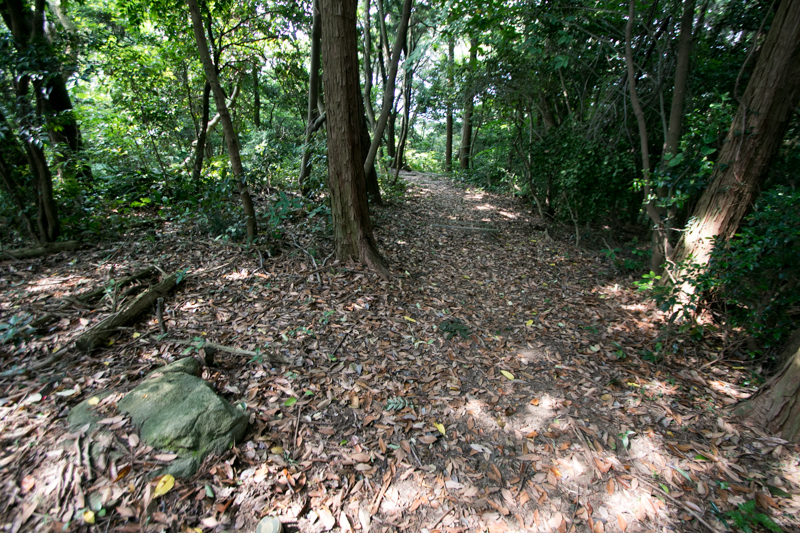 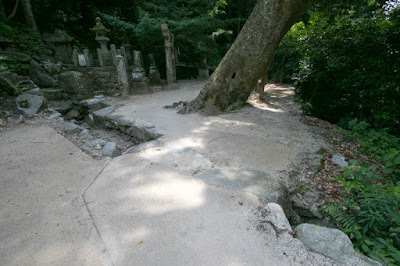 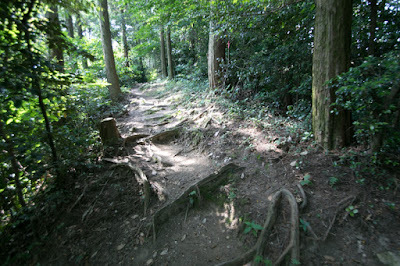 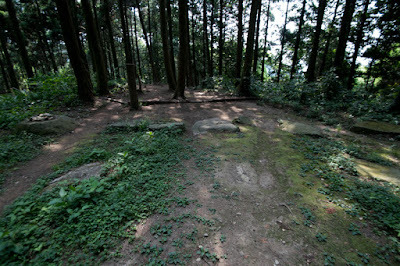 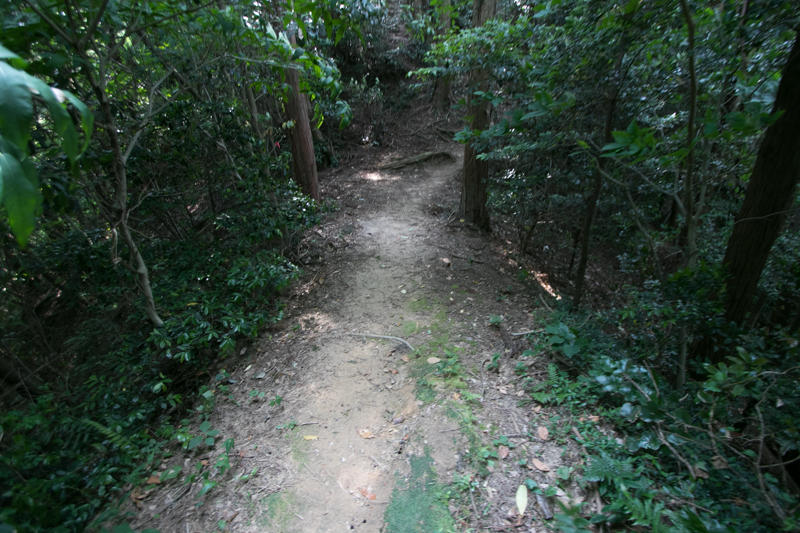 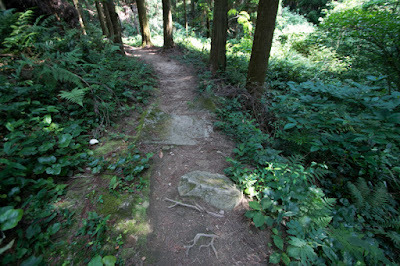 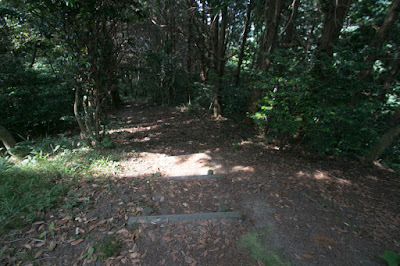 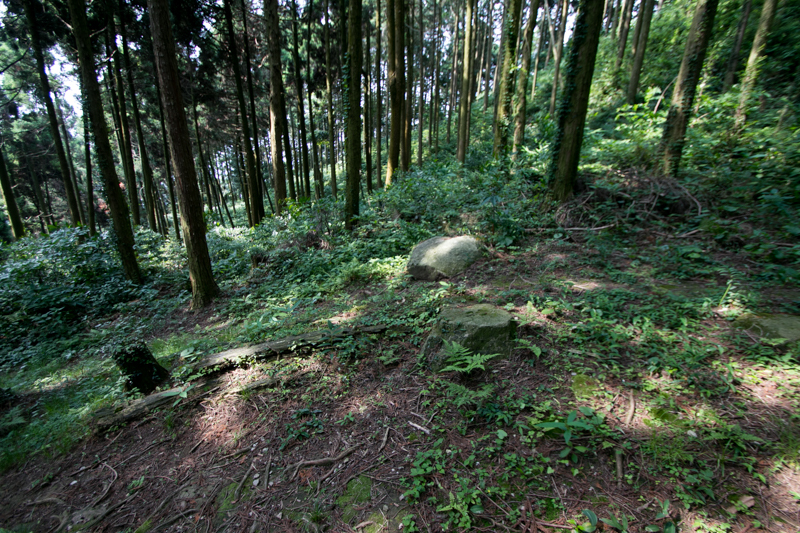 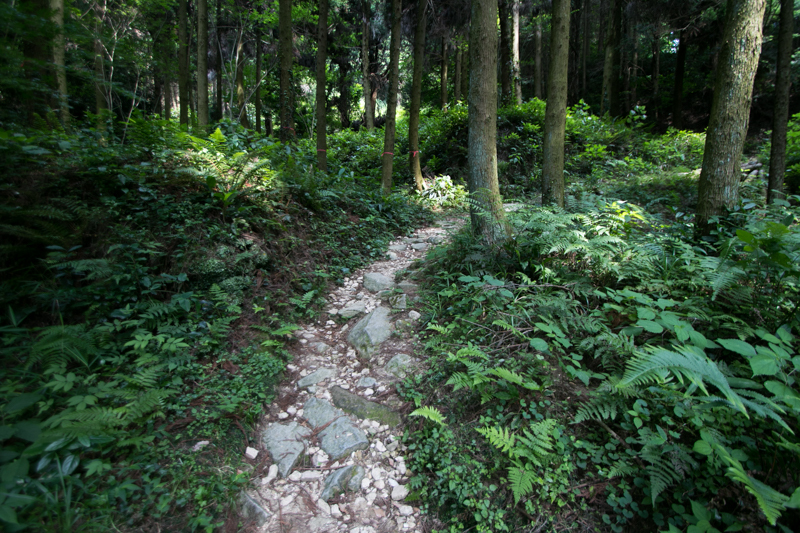 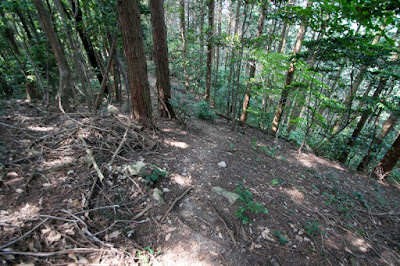 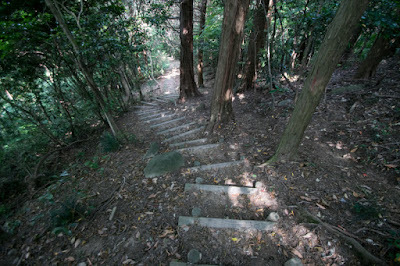 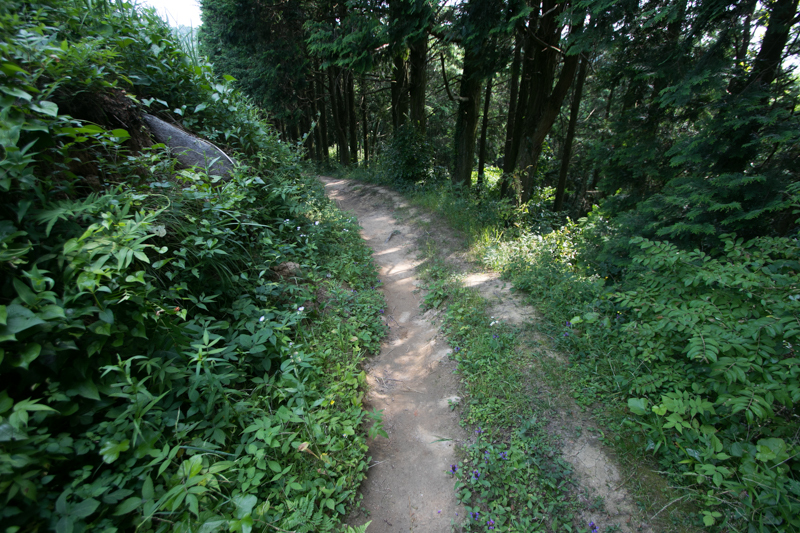 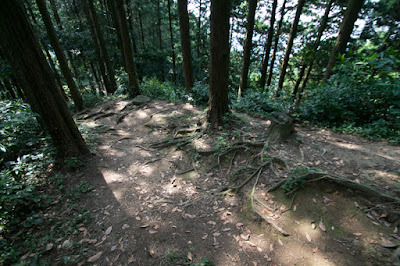 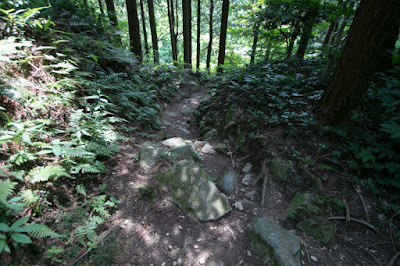 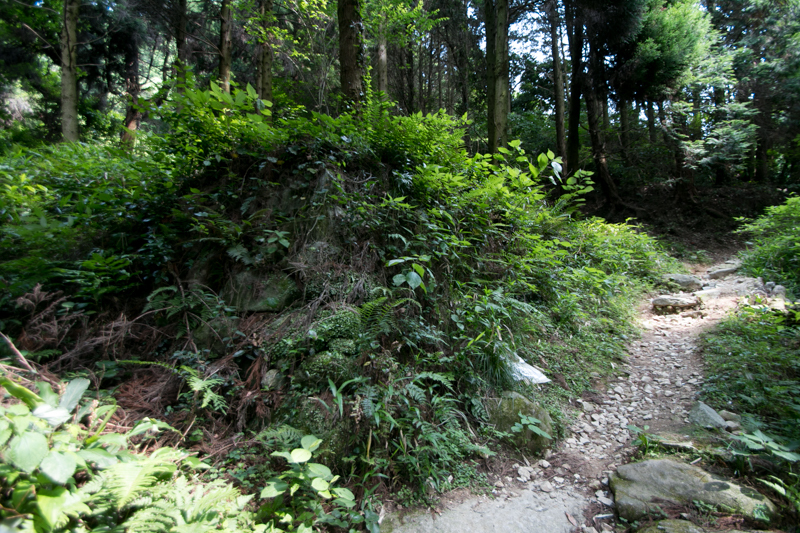 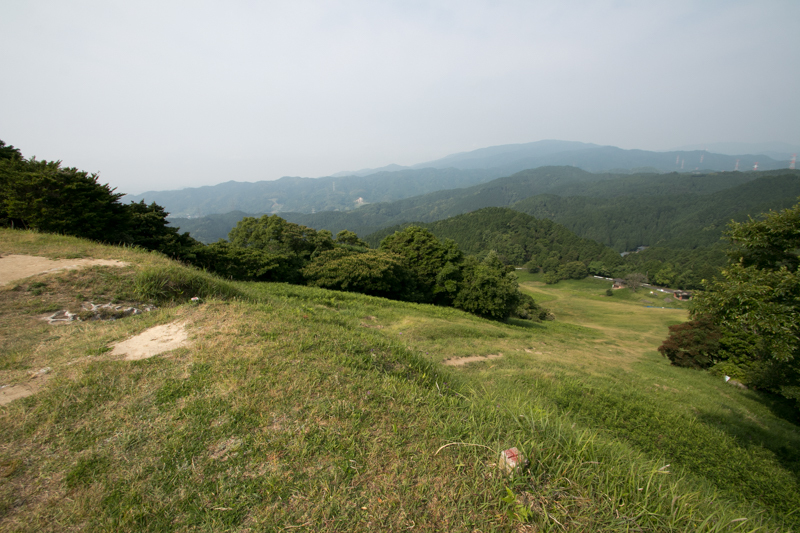 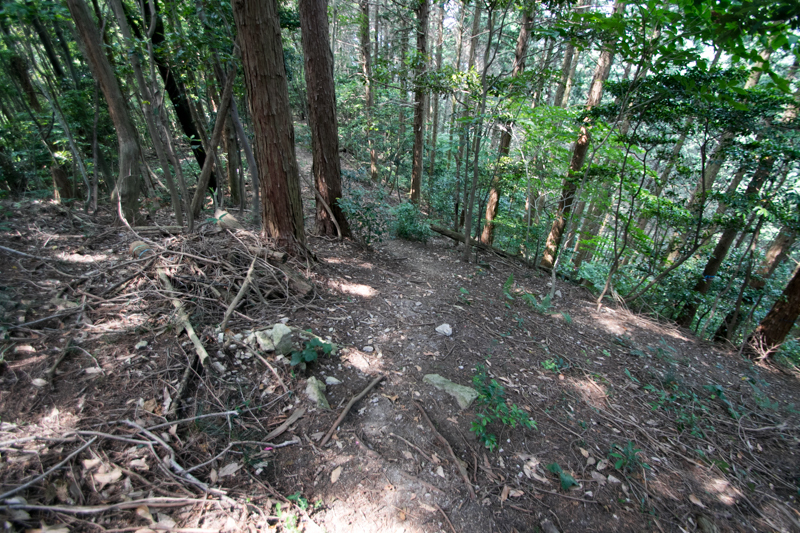 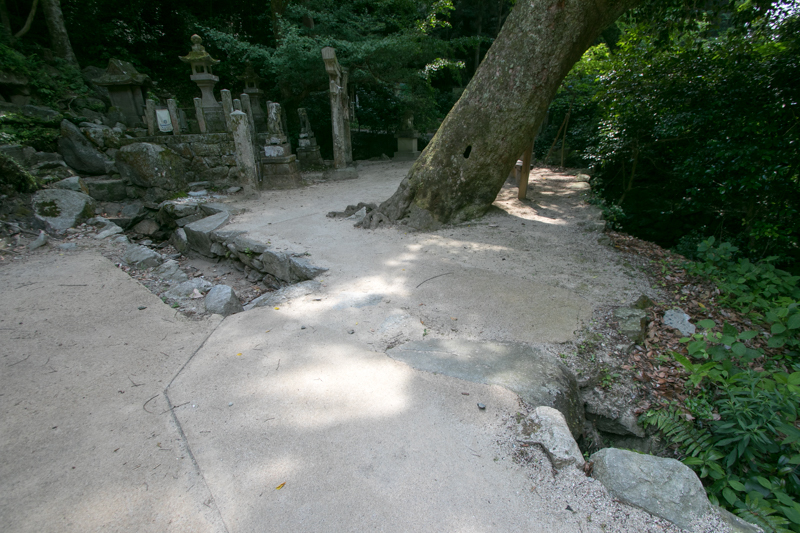 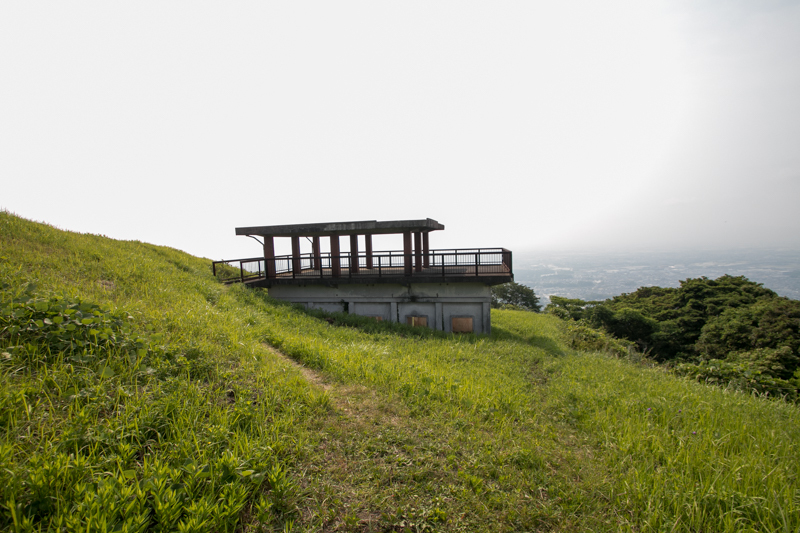 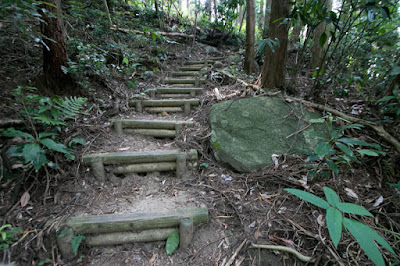 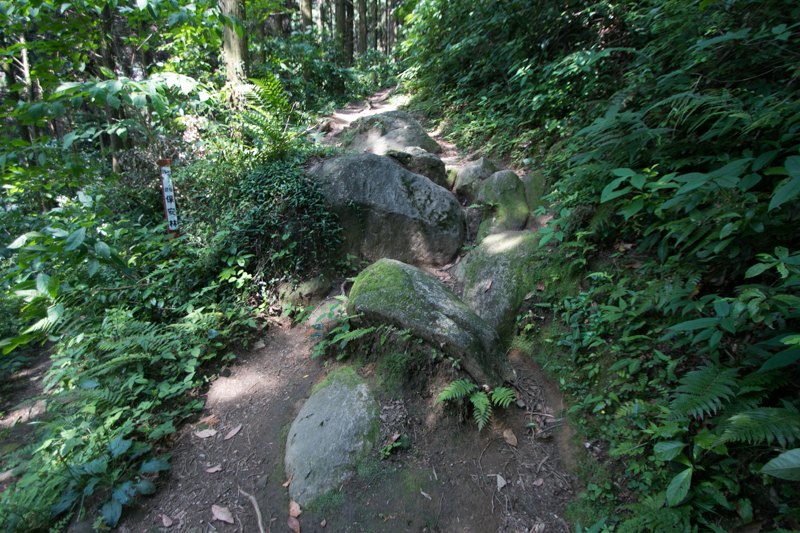 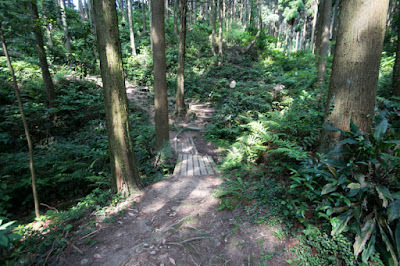 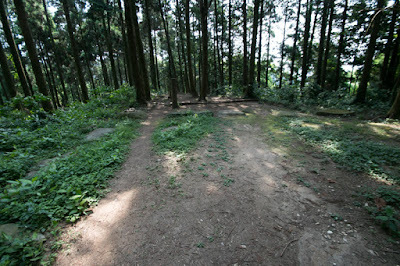 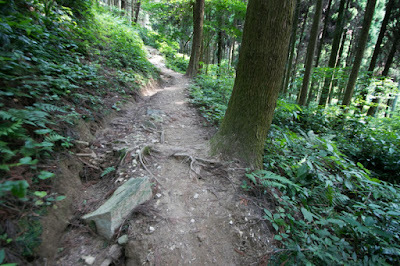 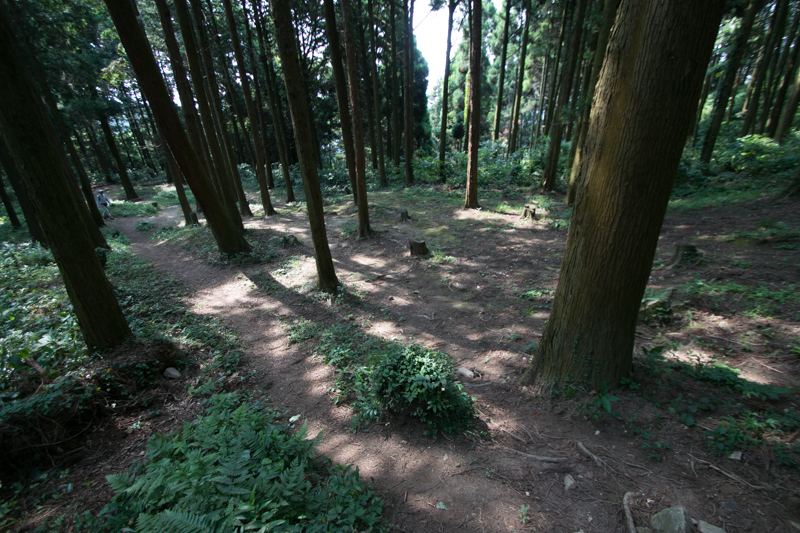 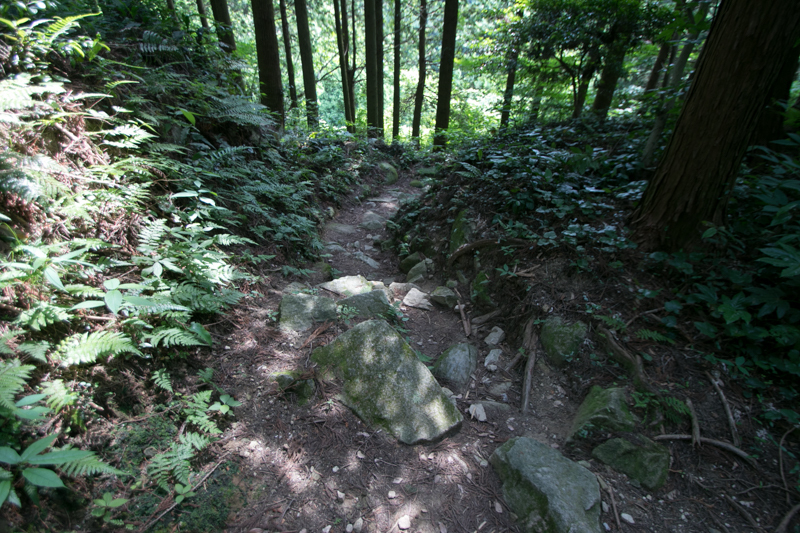 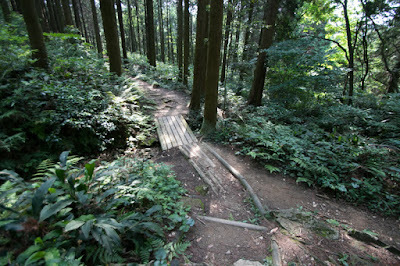 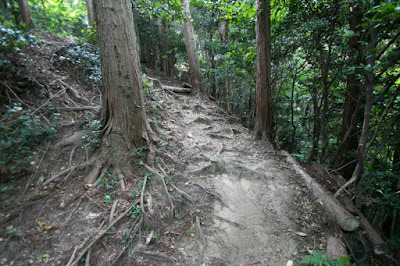 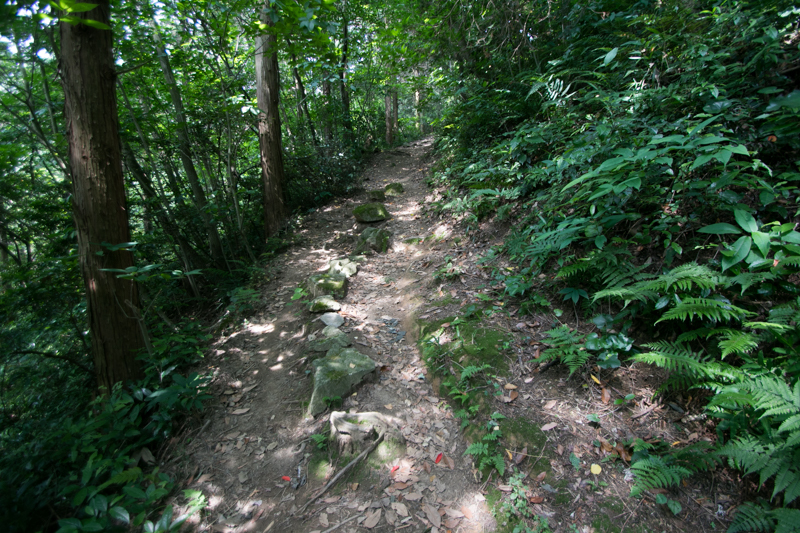 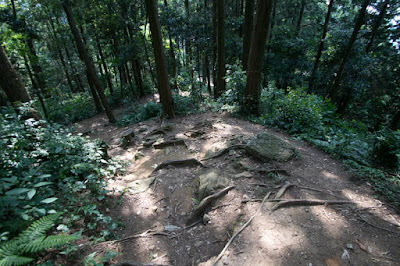 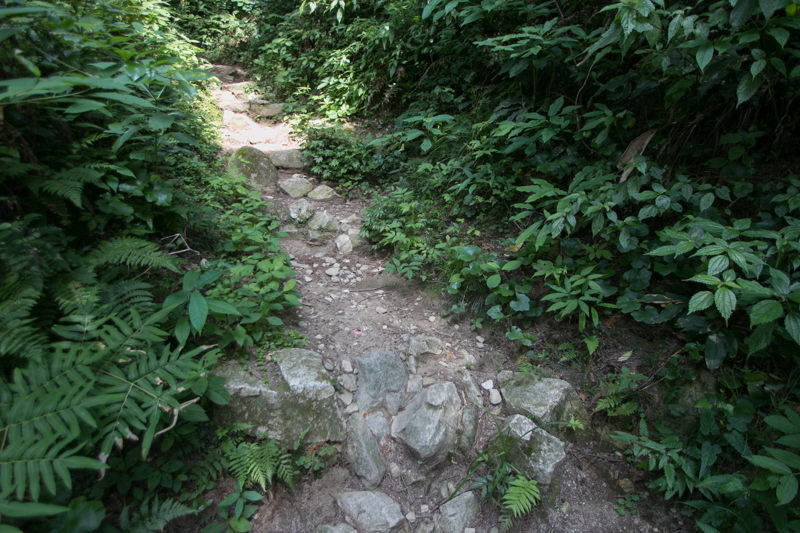 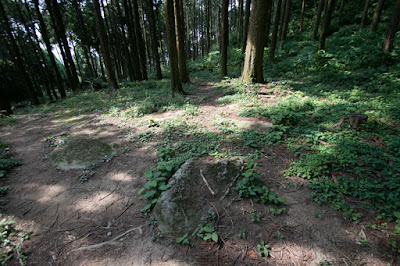 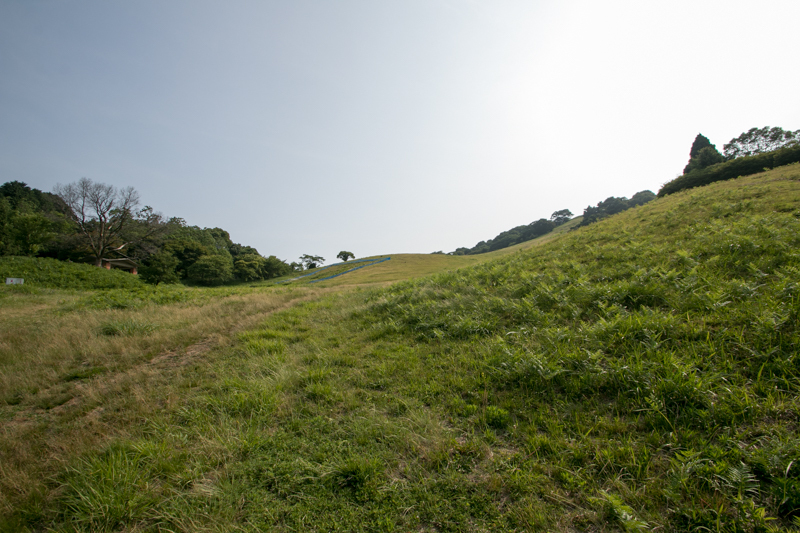 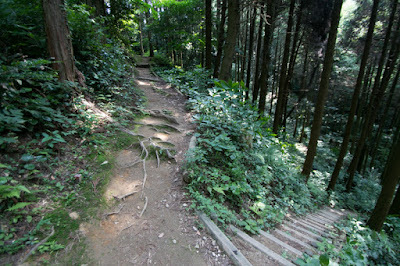 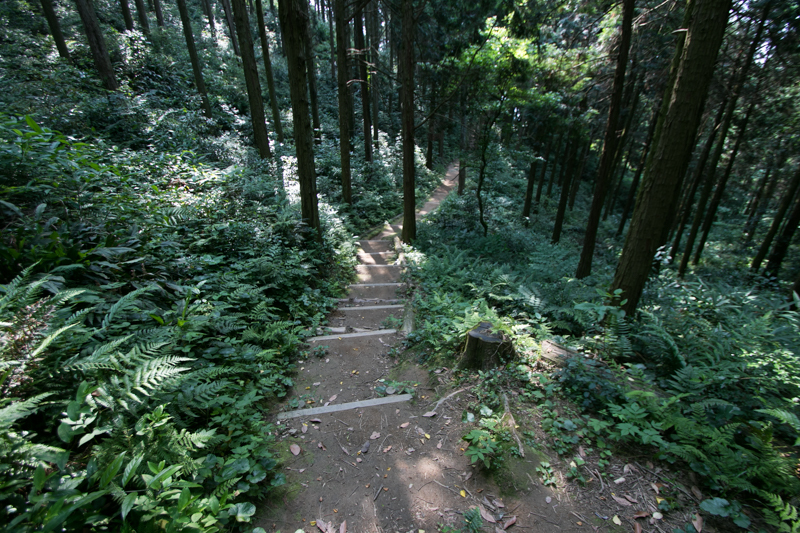 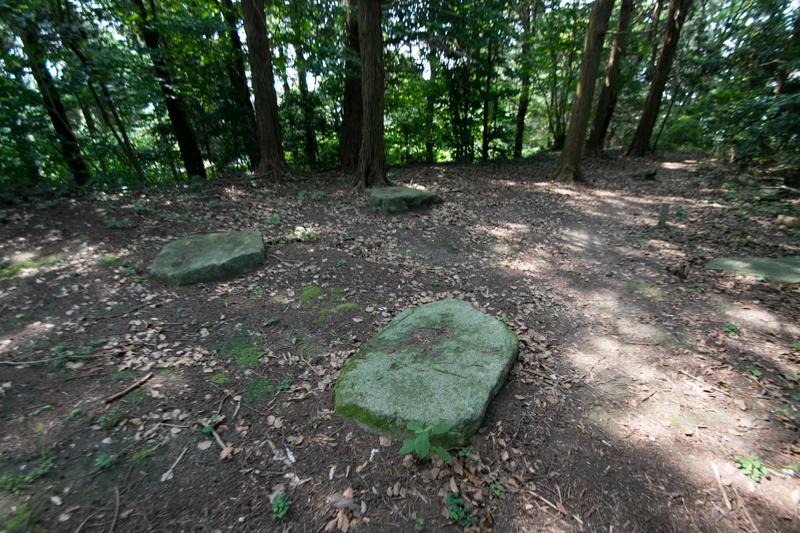 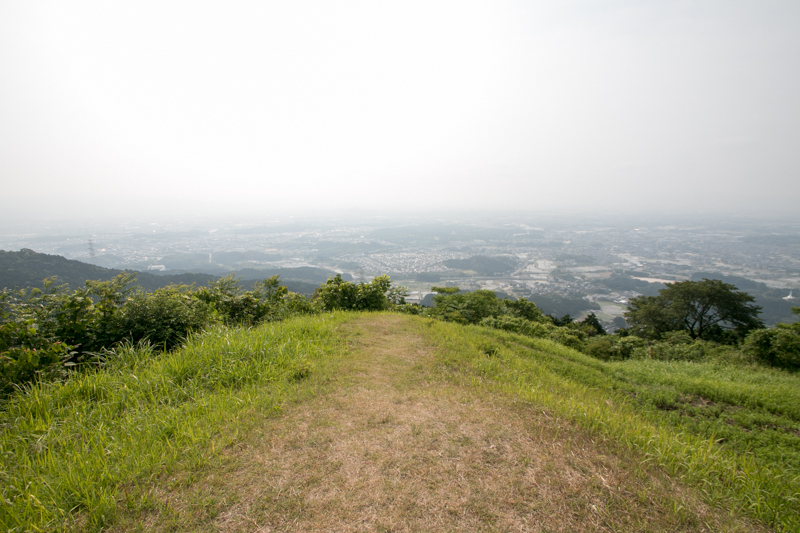 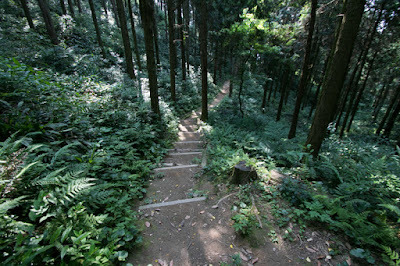 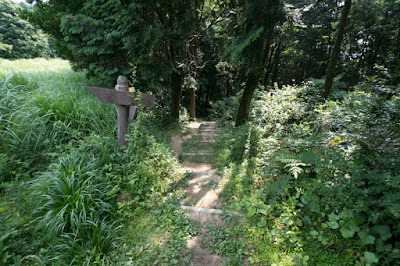 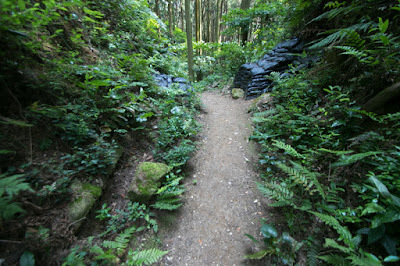 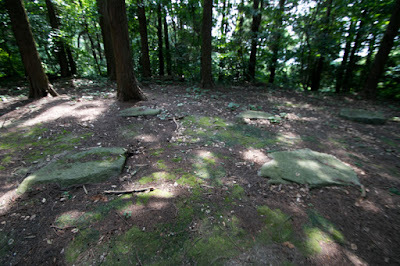 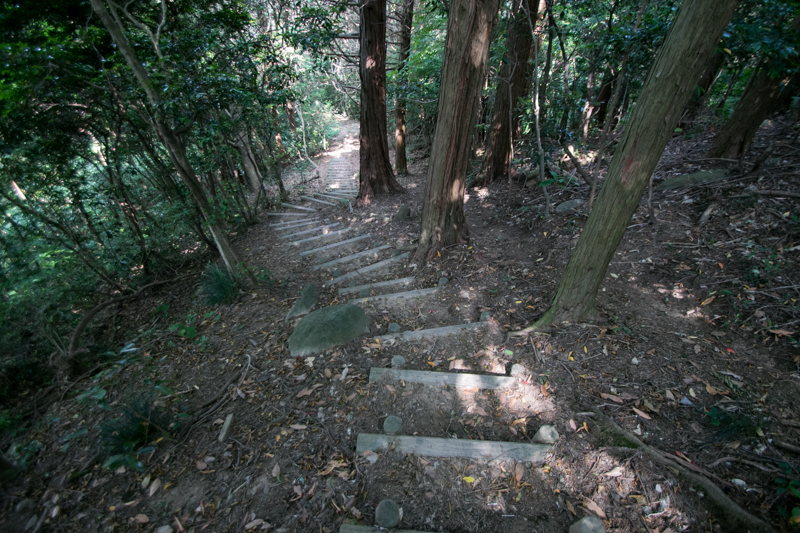 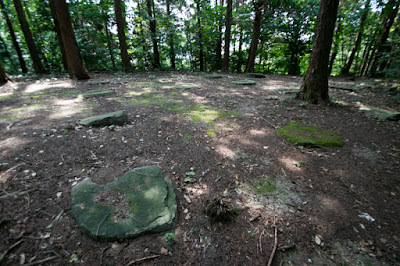 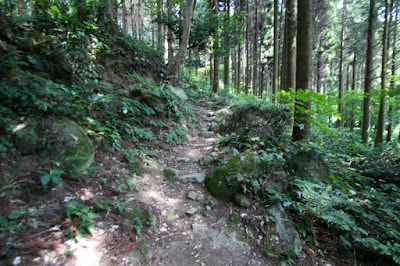 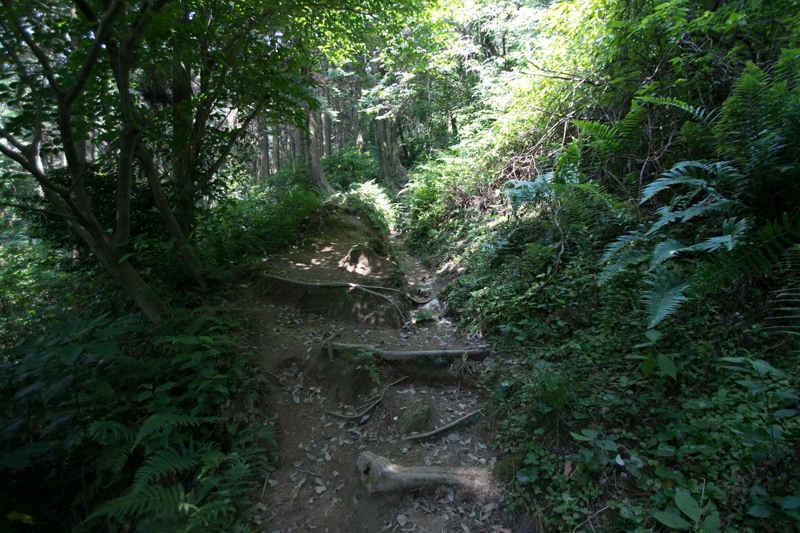 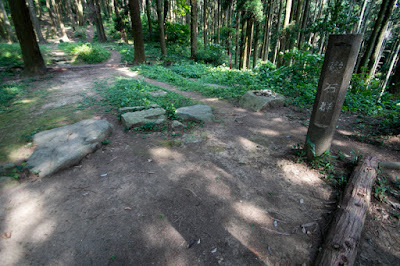 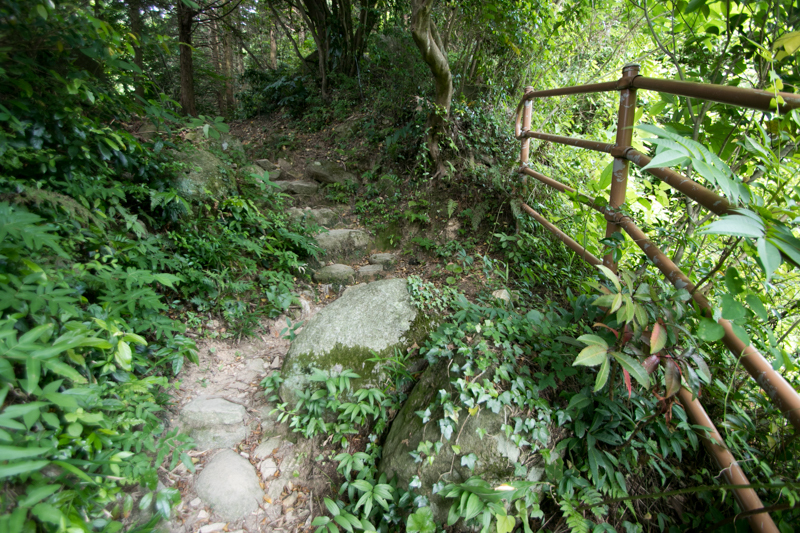 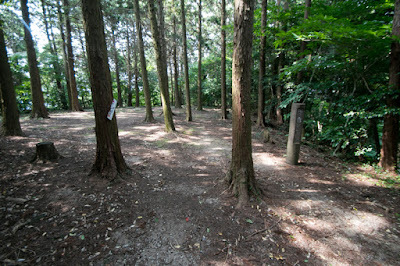 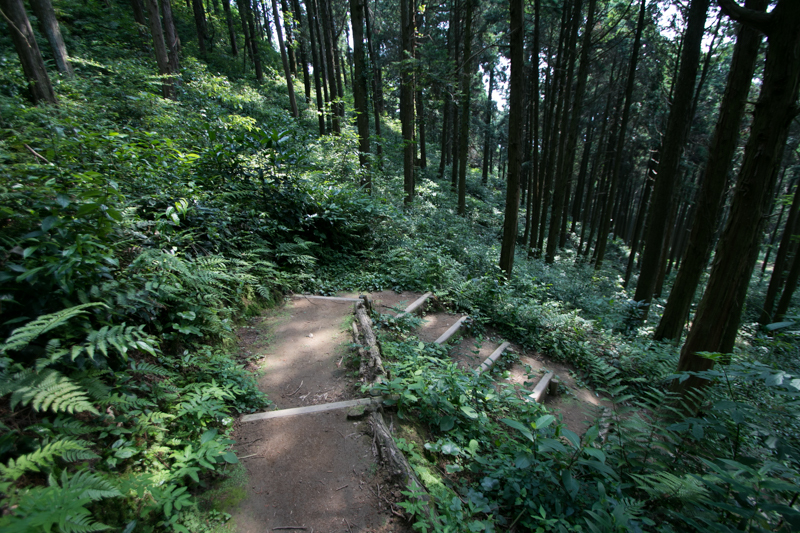 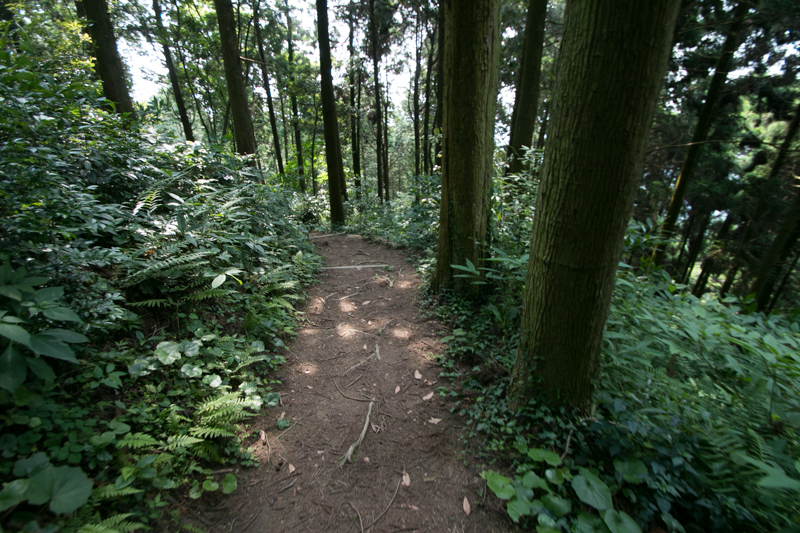 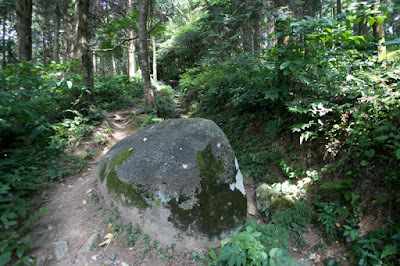 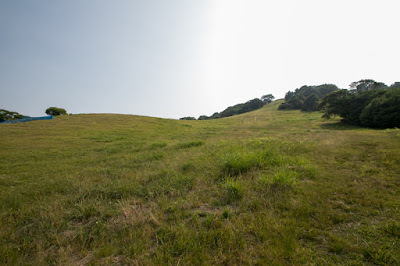 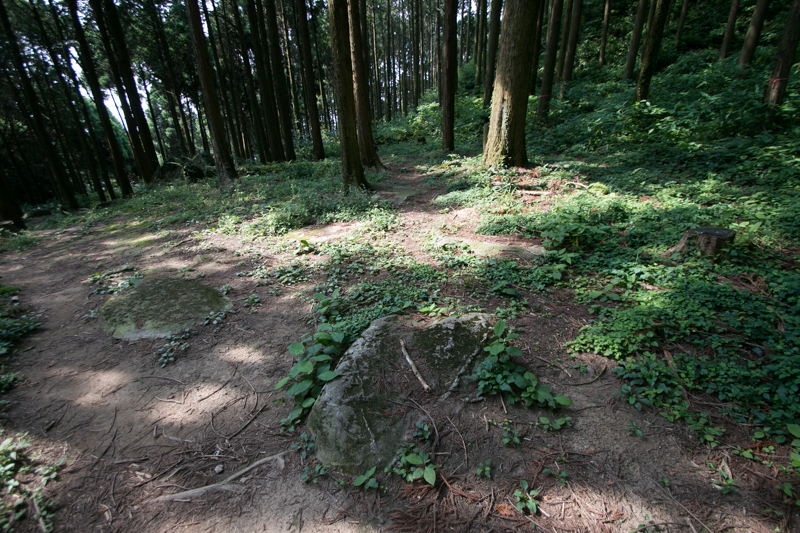 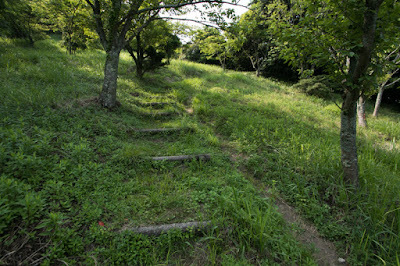 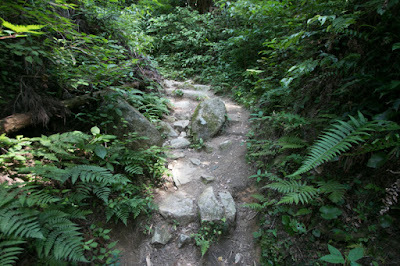 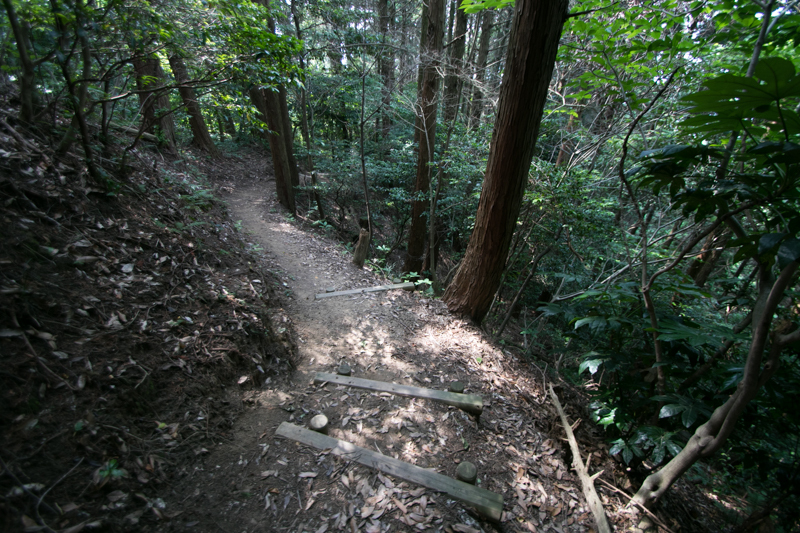 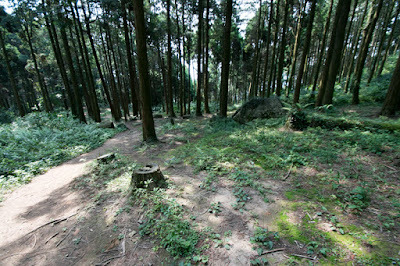 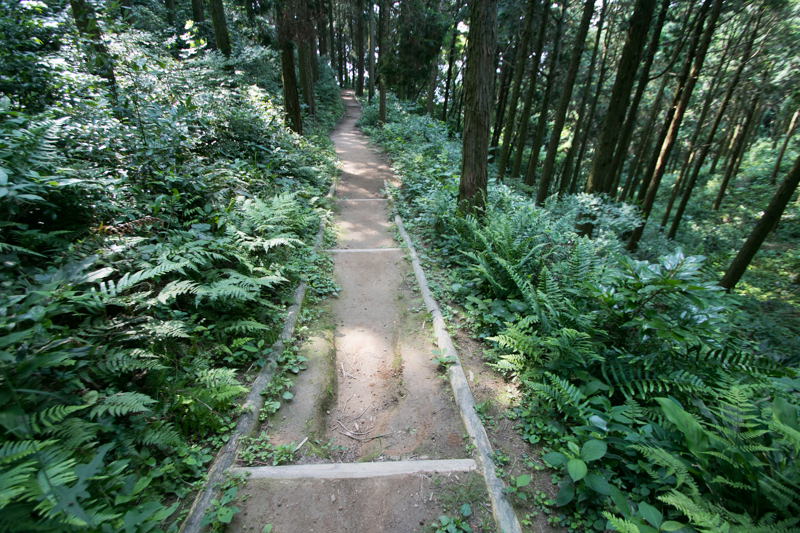 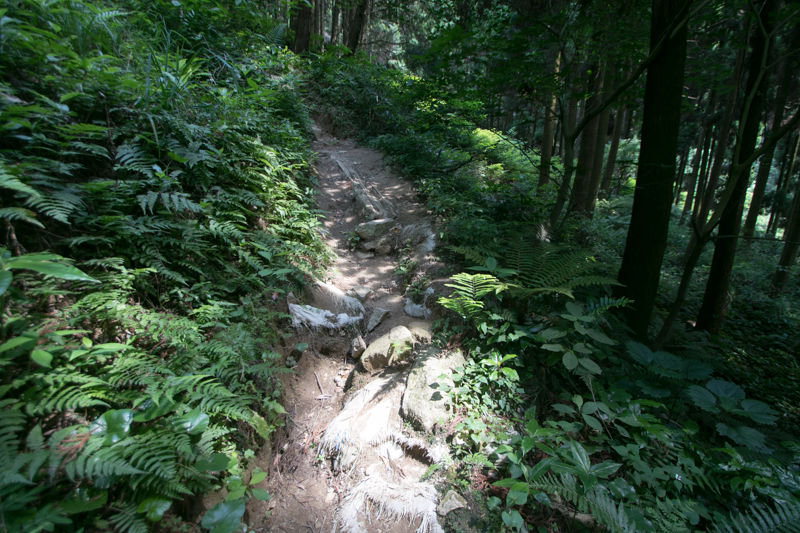 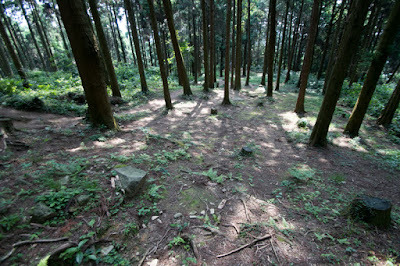 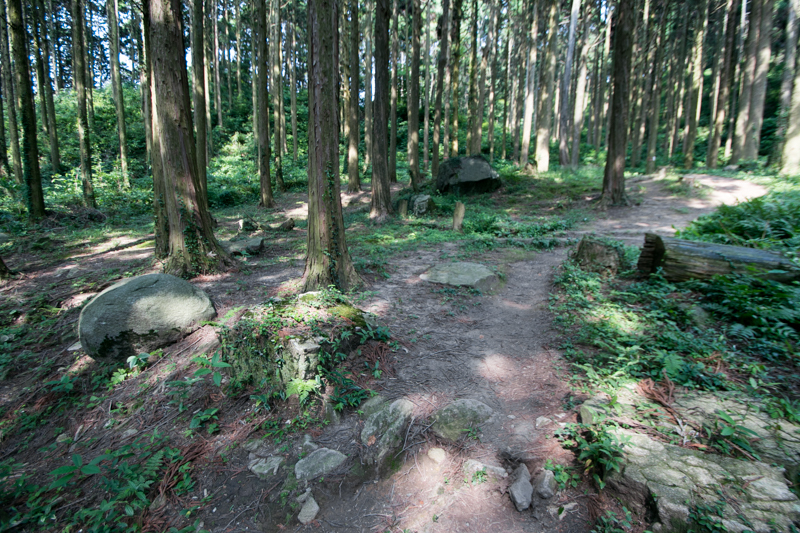 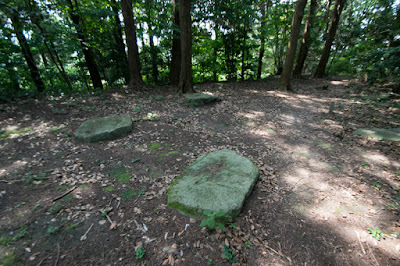 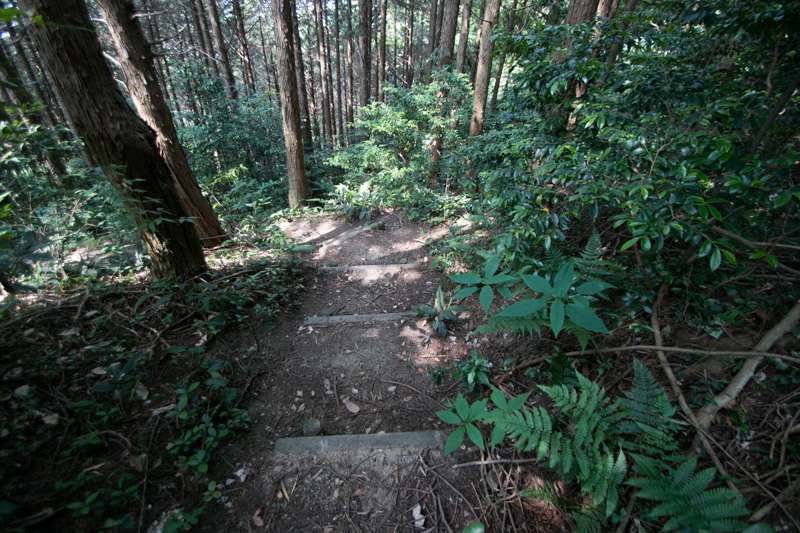 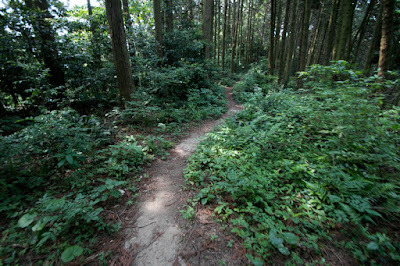 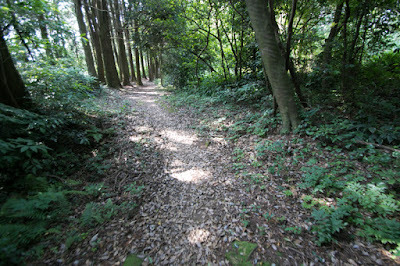 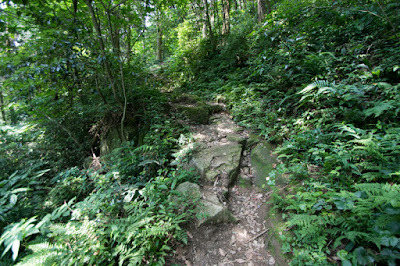 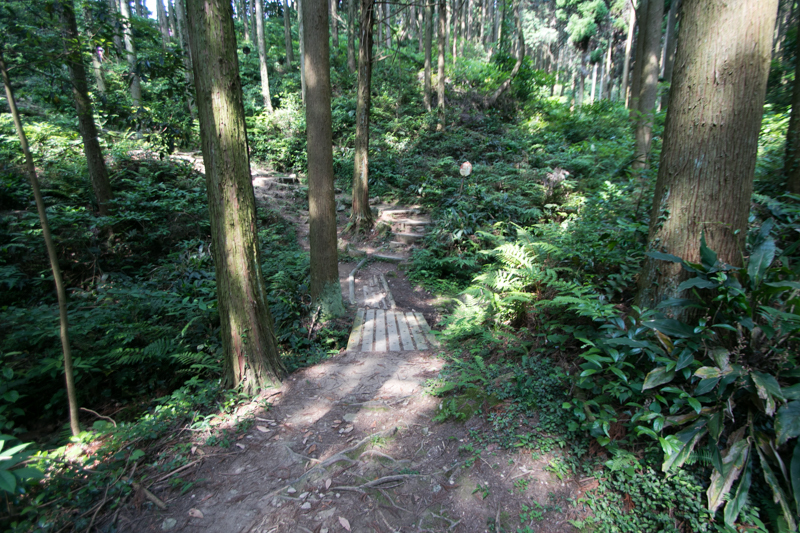 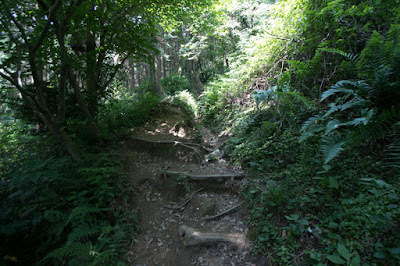 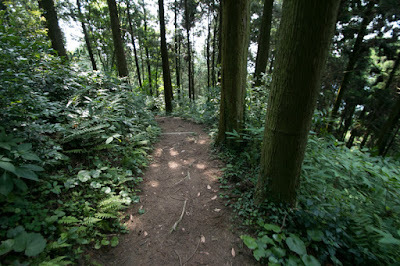 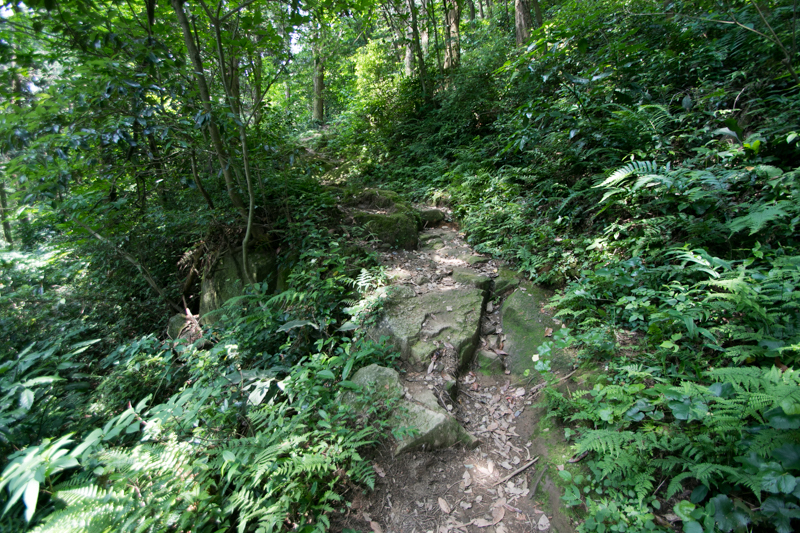 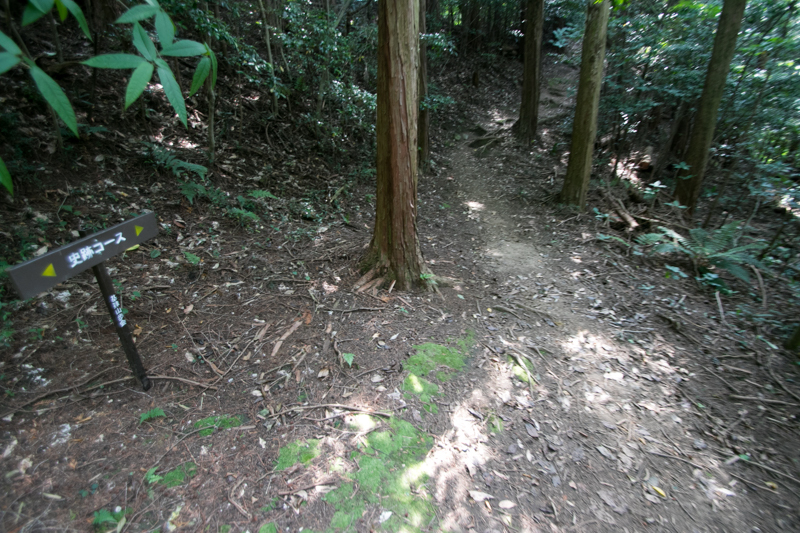 The top of the Kizan mountain is at the middle of western line, which is formed into several terraces. 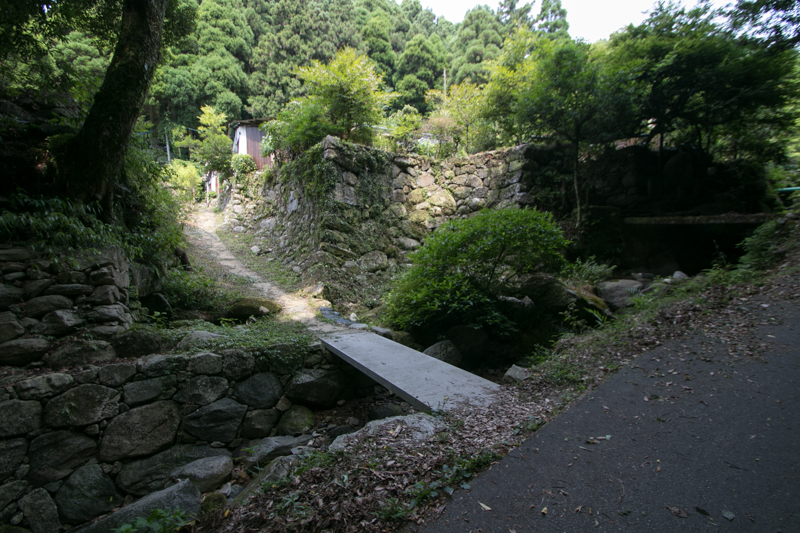 Originally there might be main building of Kii castle, but in medieval era limited part of hilltop was reused as medieval castle, with combination of dry moats separates from backward. Medieval castle area is about 200 meter and considerably large one, but this is quite limited part of the castle thus there is seen the difference between inter-state conflict and battles of local lords. 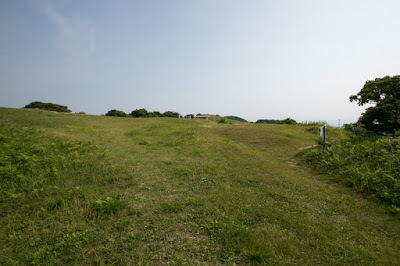 At the north of hilltop area, a considerably flat area spreads to the north edge of the clay wall. 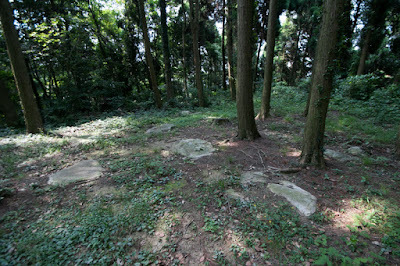 Around this area there remains cornerstones on which warehouses might be built. 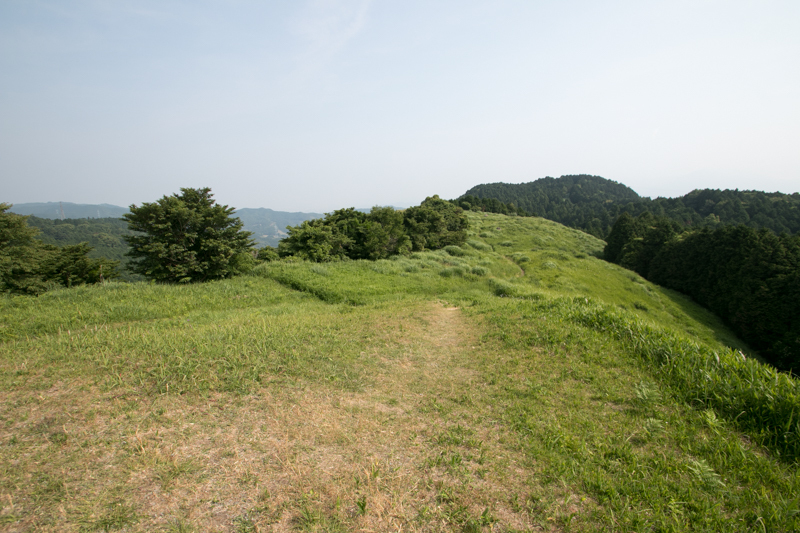 At the north edge of the castle there was the north gate of the castle, and the clay walls continues to eastern ridge ahead of the valley. 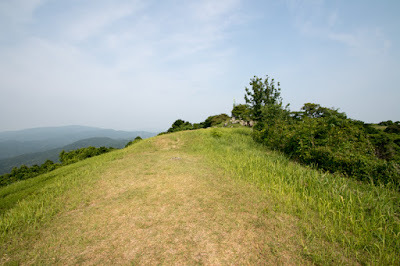 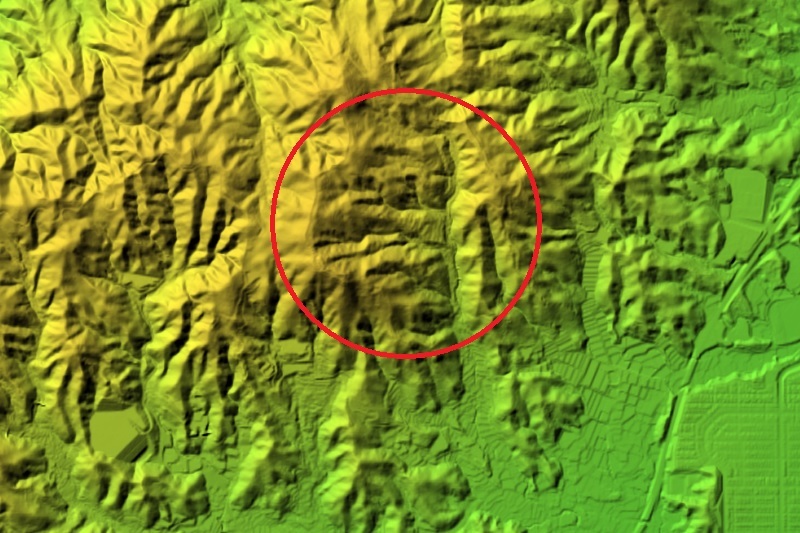 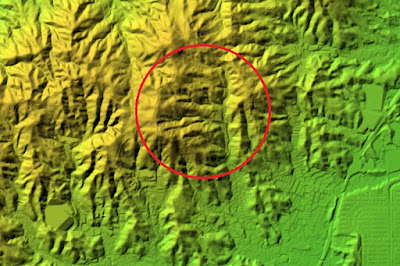 The line of clay wall goes down with the ridge, and there is a ruin of north-eastern gate at the saddle point before eastern peak. 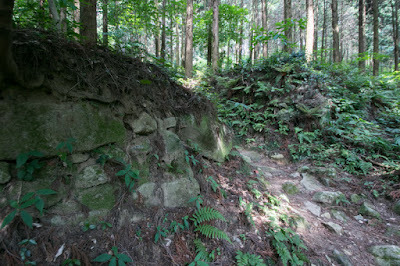 Ahead of eastern peak the clay wall goes down again, with small terraces might be as bell tower or rice storage. The clay wall finally meets water gate at its south edge, and rise up along the ridge toward hilltop area. 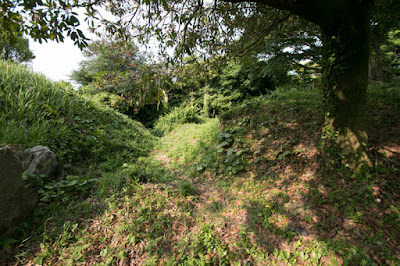 Total length of clay wall exceed four kilometer and huge resources might be input for the construction of the castle. 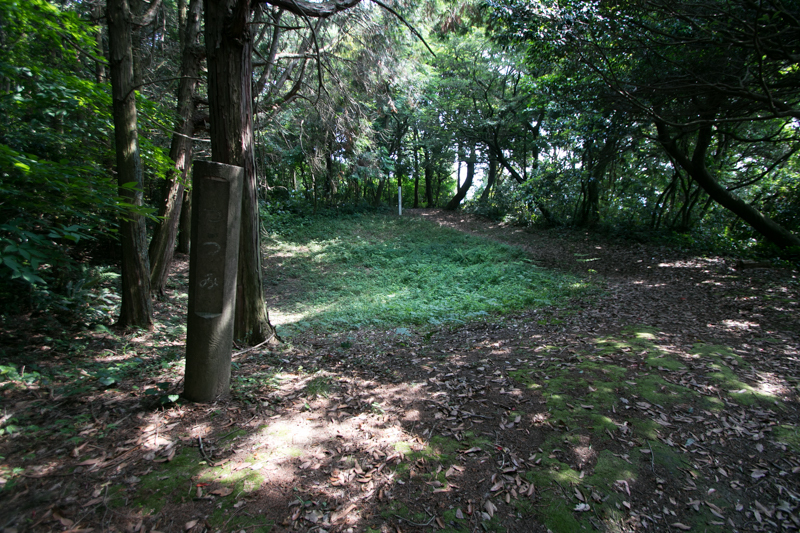 Fortunately international tension calmed down after the construction of the castle. 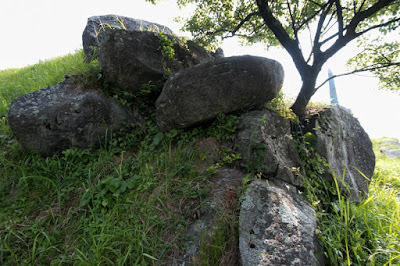 Kii castle might exist about 200 years, but was abolished around the end of 9th century. Today line of clay walls well remain around the mountain along with water gate, and excavations reveal many ruins of the castle. 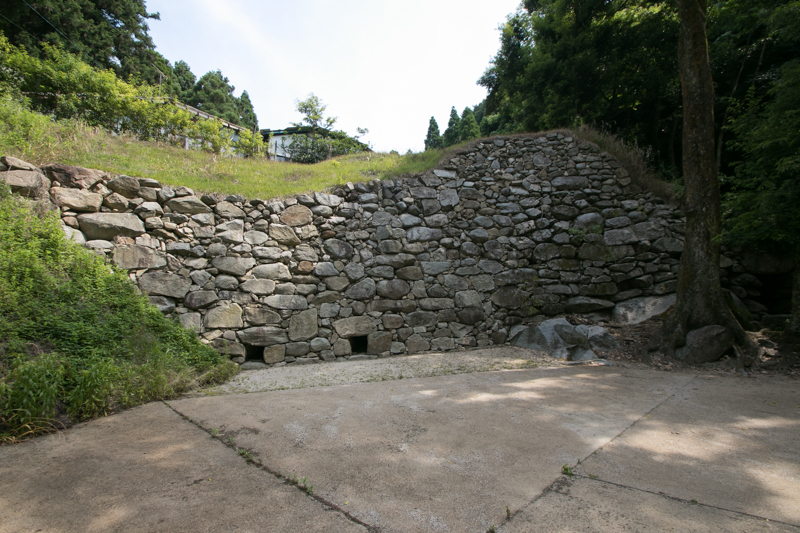 This castle is smaller than Onojo castle, but therefore the intention and structure of the castle is clearly understandable. 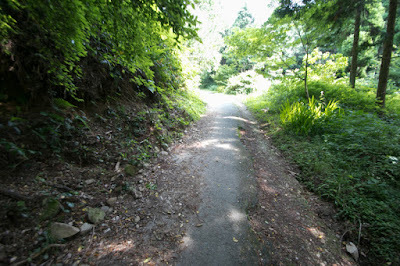 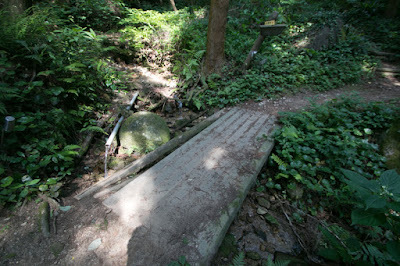 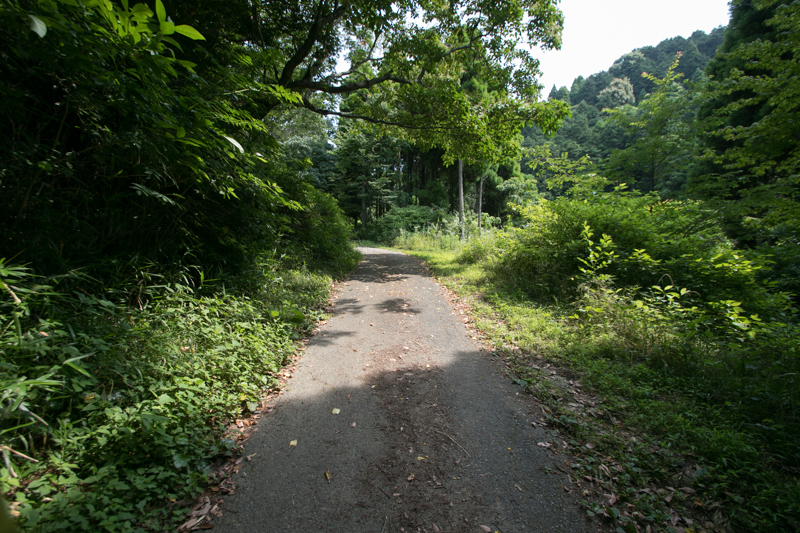 70 minutes walk from JR Kyushu Kiyama station. 20 minutes drive from Tosu-Chikushino Road Miyaura interchange to hilltop parking.